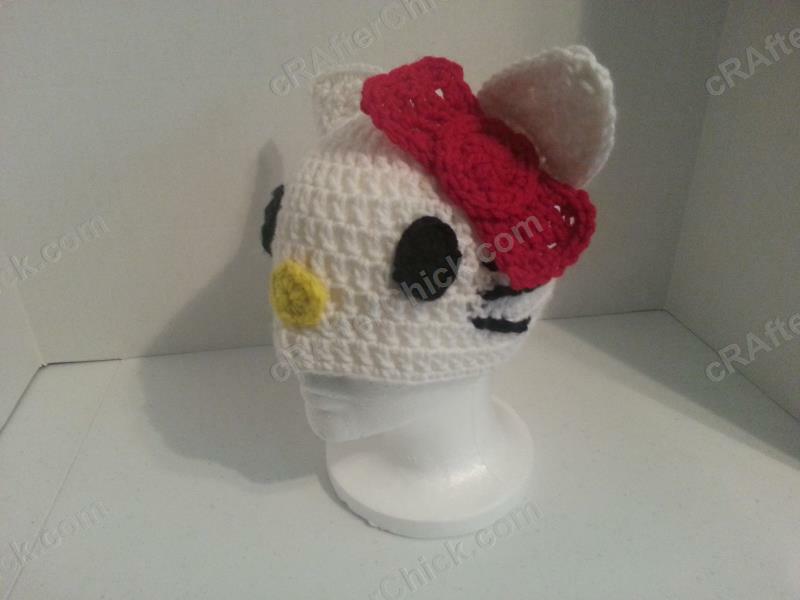 This crochet pattern was a special design at the request of one of our guy friends. 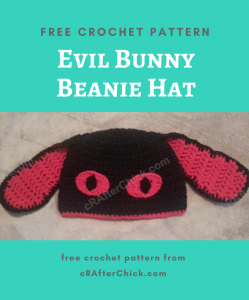 An evil bunny? in his favorite colors black and red? Why not? 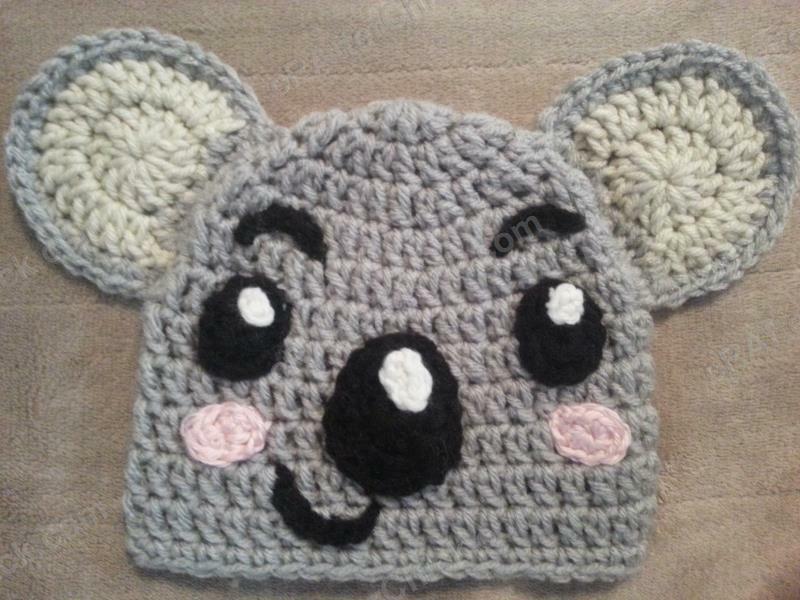 So I made up this hat just for him but had to keep the pattern to share with everyone of course. 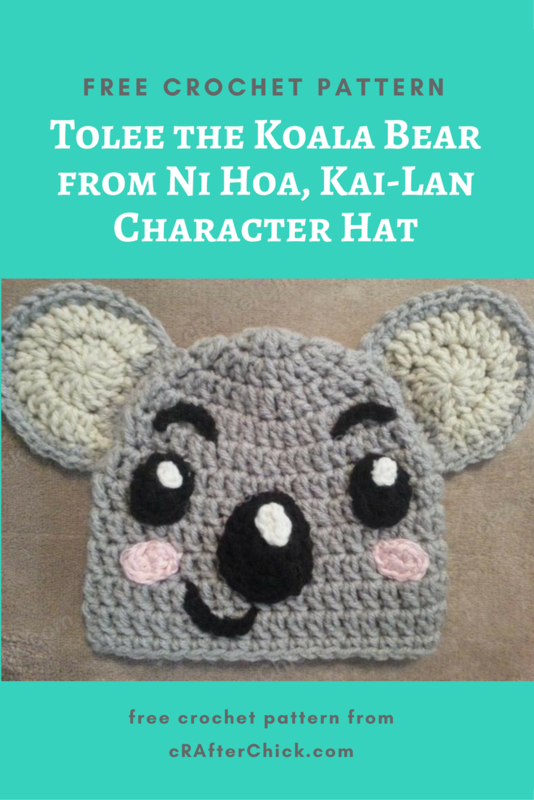 This is an advanced beginner crochet project with very few pieces for a character or animal hat so it’s not that hard to do in one sitting even. It makes a perfect fun gift for those that are a little into the darker sides of things, males and even Halloween costumes. This little guy kind of grew on me while I was making him up. 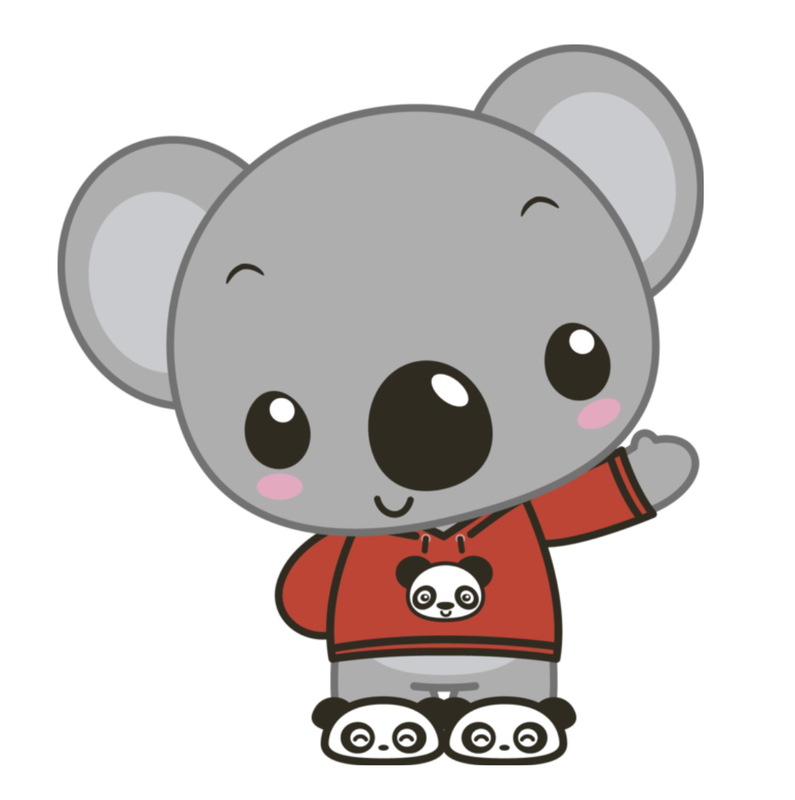 I think he may be leaning more to cute than evil though. Oops. The hat in this picture is made with my free Easy Peasy Large Adult / Men Sized Double Crochet Beanie Pattern, which you can find here as a foundation for the project. 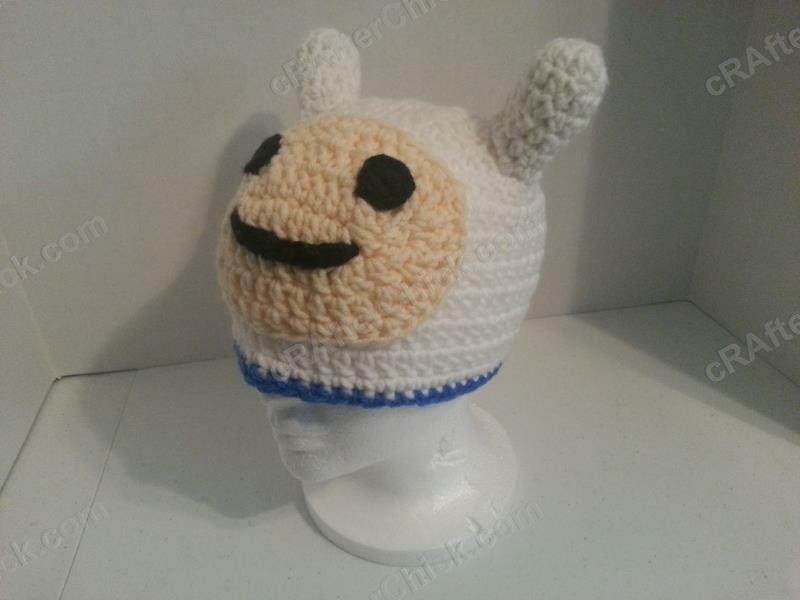 Want it in another size? No worries. 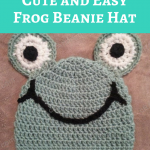 Head over to Easy Peasy All Family Sizes Free Double Crochet Beanie Patterns to select the size of the free pattern you want for your project. 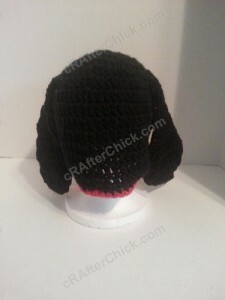 In order to make the contrast trim, once you have completed your beanie base, attach the red yarn to the last st worked with a sl st. Ch 1 before placing 1 sc in 1st st and in each of the following st around. Sl st back in top of the 1st st worked before fastening off. 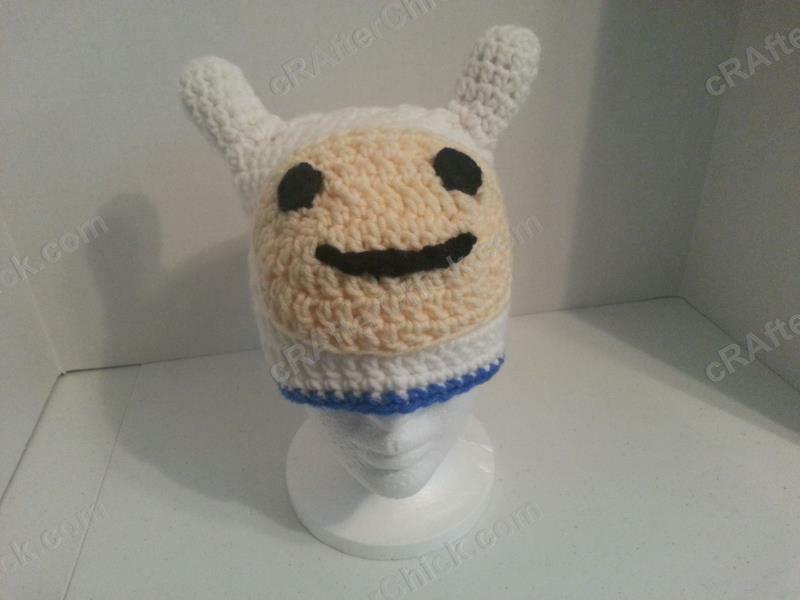 Now that you have finished your beanie for the base you are ready to start making the pieces for your own evil bunny hat. Repeat Rows 1 -13 or Inner Ear as above. 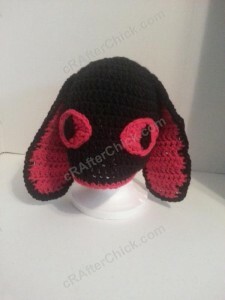 Ear Assembly (Make 2): using black yarn, 2 finished inner ear and 2 finished outer ear pieces from previous step. Placing 1 completed ear front in front of a finished ear back, line up the st. Attach black yarn to top left corner stitch. Ch 1 before making 1 sc in each st down ear towards bottom, working through both pieces at same time counterclockwise around ear. When you reach the bottom 7 st, place 2 sc in each of these st to give the ear a more rounded bottom. Resume making 1 sc in each st up to top right corner, place (3 sc in corner), 1 sc in each of the st across to you reach 1st st worked. Place 2 more sc in same st as 1st st before sl st in to the top of the 1st st in round. 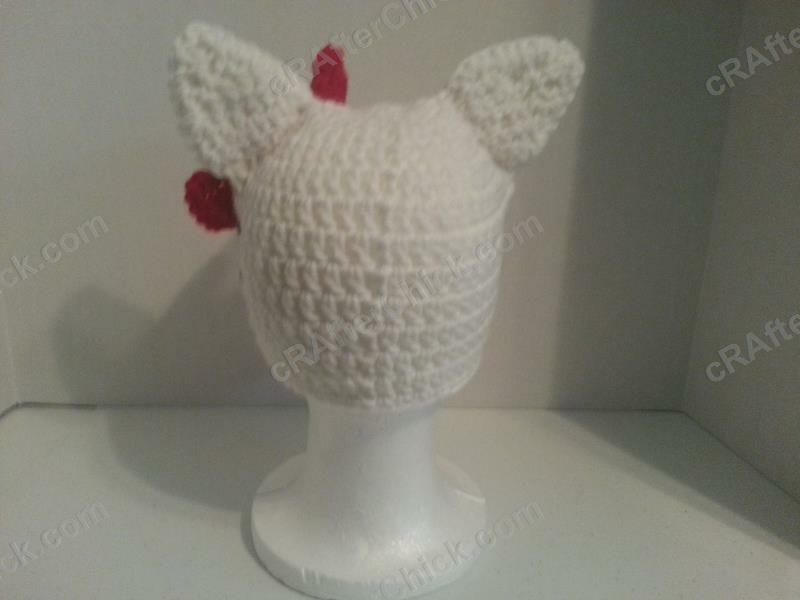 Before you cut the yarn, make sure you leave a long enough of a tail of yarn to be able to secure your ear in place on your beanie hat during assembly. Put to side until needed for assembly. Before you cut your yarn, make sure you leave a long enough of a tail of yarn to be able to secure your assembled eye in place on your beanie hat during eye assembly. Place to side until needed in finishing steps. Repeat process for second eye color piece. *The feature above works great for toddler, youth, preteen, teen, womens and mens sized hats. 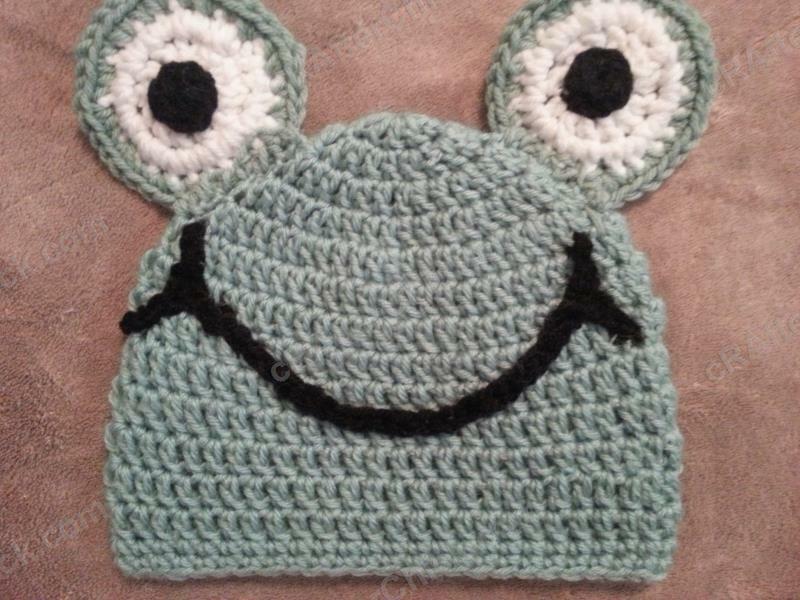 For newborn to 12 month sized hats, skip Round 2 only doing Round 1 of above instructions. Ch 4. Make 1 sc in 2nd ch from hook, 1 sc in next ch and sl st in remaining ch. Ch 1 and turn to work backside of chain. Work 1 sc in 1st 2 st and sl st in to the last st of chain. Make sure you leave a short yarn tail that is long enough to secure your eye pupil in place on your evil bunny’s eye before you cut the yarn, pull through last st and place to side for now. Ch 4. Make a sl st in the 3rd ch from the hook and sl st in last ch from hook. 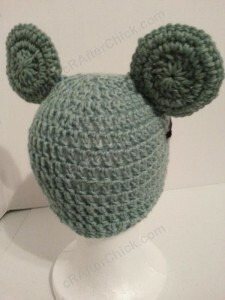 Leave a short enough yarn tail to be able to sew this little piece in to an elongated oval during eye assembly steps. Now that all your features are made, you are now ready to move on to the finishing off steps up next. 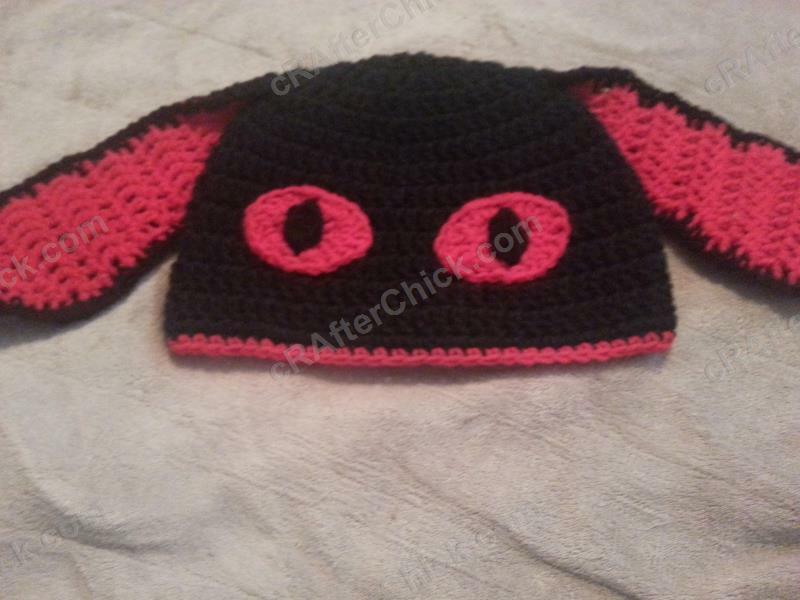 Starting with your eyes, we are going to assemble the eye pupils and eye colors together into completed eyes before attaching them to the evil bunny hat. 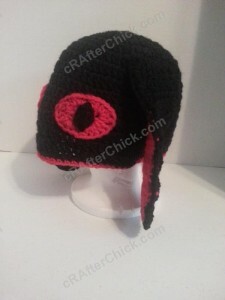 Take the leftover black (main color) yarn tail from one eye pupil and your yarn needle to sew your pupil in place in the center of one red (contrast color) eye color piece. You want to place it so that it is long wise, up and down, vertical. 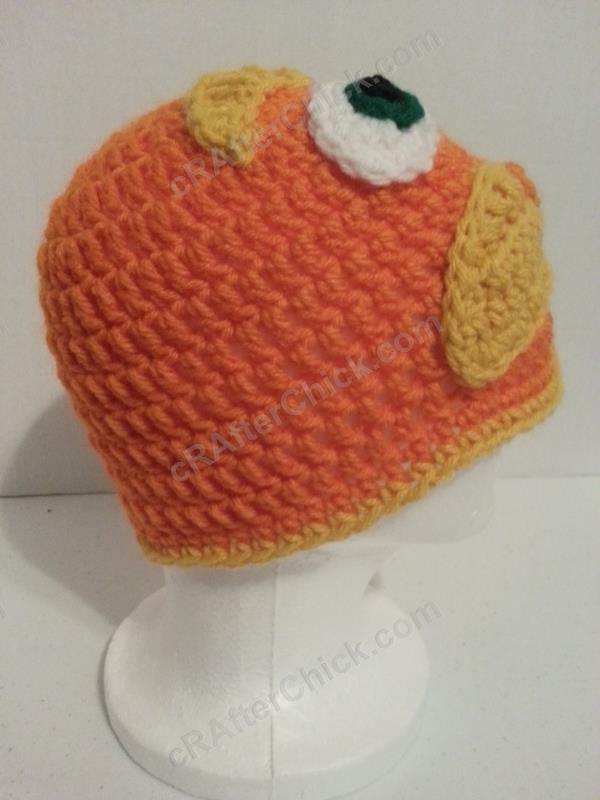 Once it is securely in place, pull your yarn to the back of the assembled eye before fastening off. Repeat this process for your second eye. 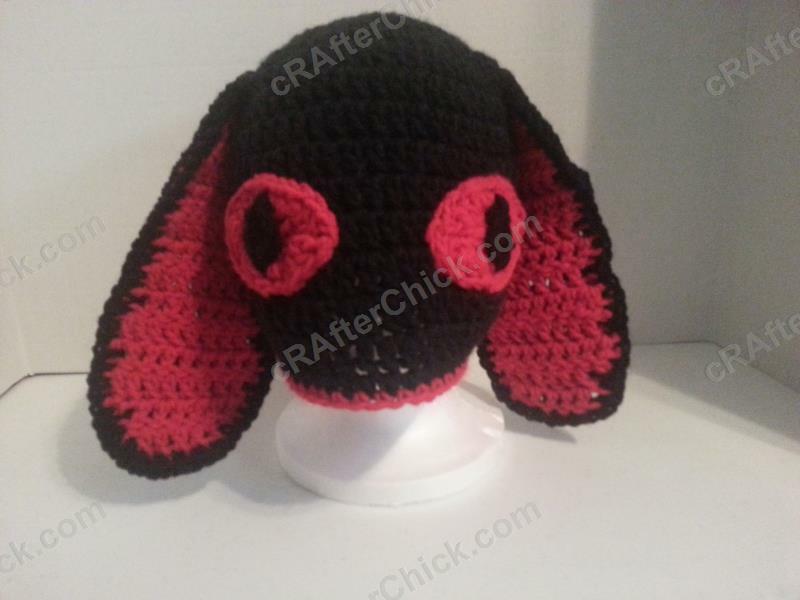 Next take the leftover red (contrast color) yarn tail from your assembled eye and using your yarn needle sew the bunny’s eye directly on to the beanie. Since these are the only beanie feature, feel free to play around with the placement. You may like it more down low on the hat, in the middle or even up high. You can reference my pictures on where I placed the eyes on my evil bunny hat. 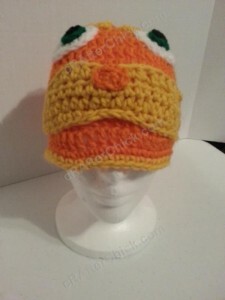 Once you have sewn it in place, pull yarn to inside of beanie hat and fasten off. Repeat this process for your second eye. 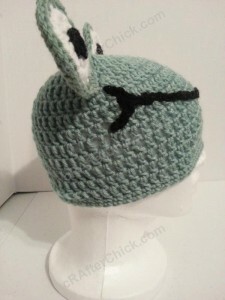 Now take the leftover black (main color) yarn tail from one assembled ear and sew it on to the desired location with the yarn needle on your evil bunny hat. If you want longer hanging ears, place lower on the hat. If you want shorter hanger ears, place higher on hat. 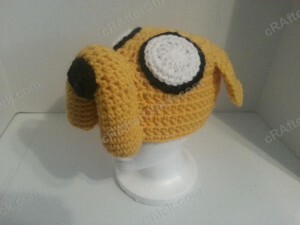 For head top floppy ears, place on top of hat with contrast color piece facing forward. 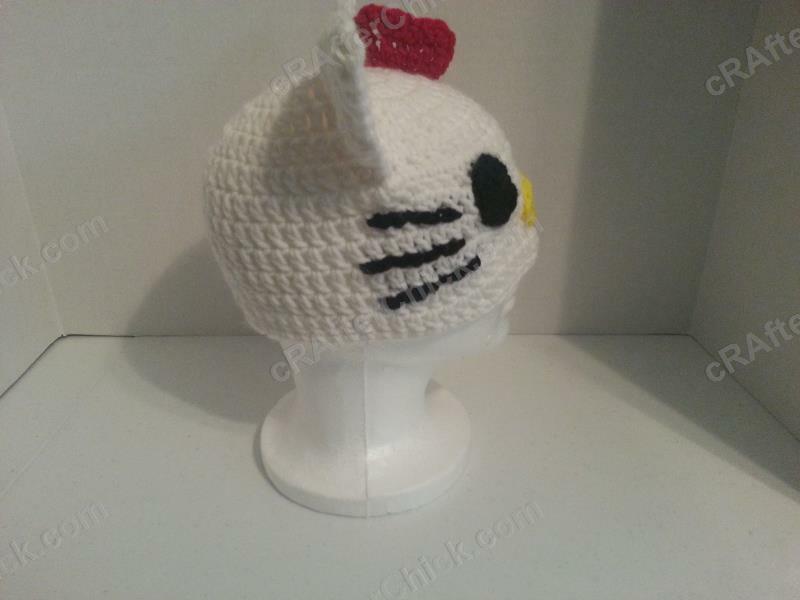 You can also place the ears on the side of the head with the red facing forward more towards the top so that they will flop forward with peeks at the red also. You can see how I placed the ears on this evil bunny hat as requested by our male friend in my pictures. 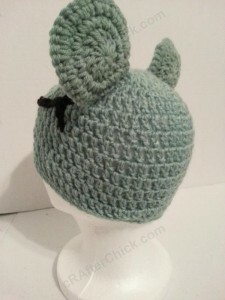 Once you have secured the ear fully in place, pull the leftover yarn tail to the inside of the hat before fastening off. Repeat for second ear. Take the time now to look over your assembled hat to check for any loose ends or tails you might of missed during assembly process. Take the time now to sew them in and fasten off. All done! 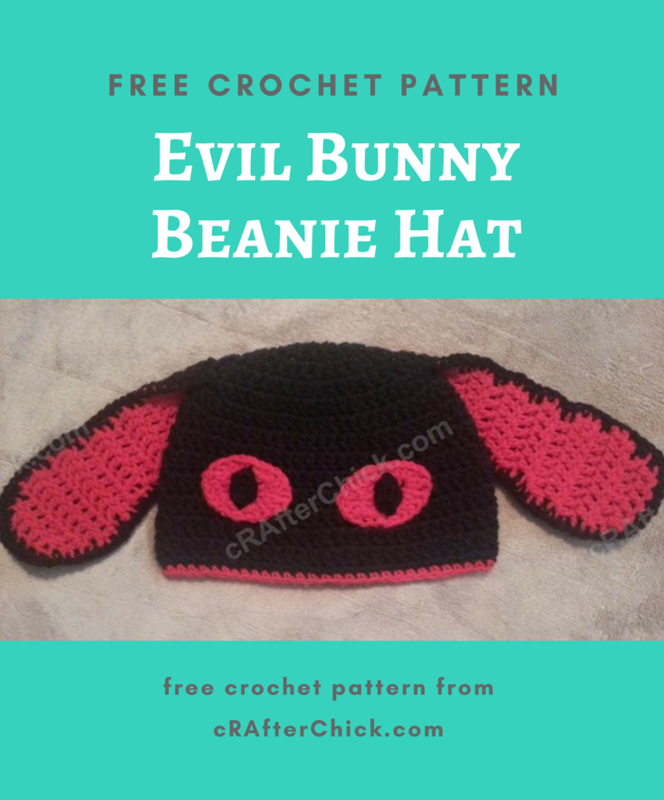 One super evil looking bunny hat ready to wear. I told you it wasn’t too complicated. Happy crafting! This a super easy and cute frog hat crochet pattern. It works up really fast and is great for last minute gift ideas or to work on project when you don’t have much time to fill. I tried to make it as easy as possible and I think it’s very beginner friendly so give it a try. 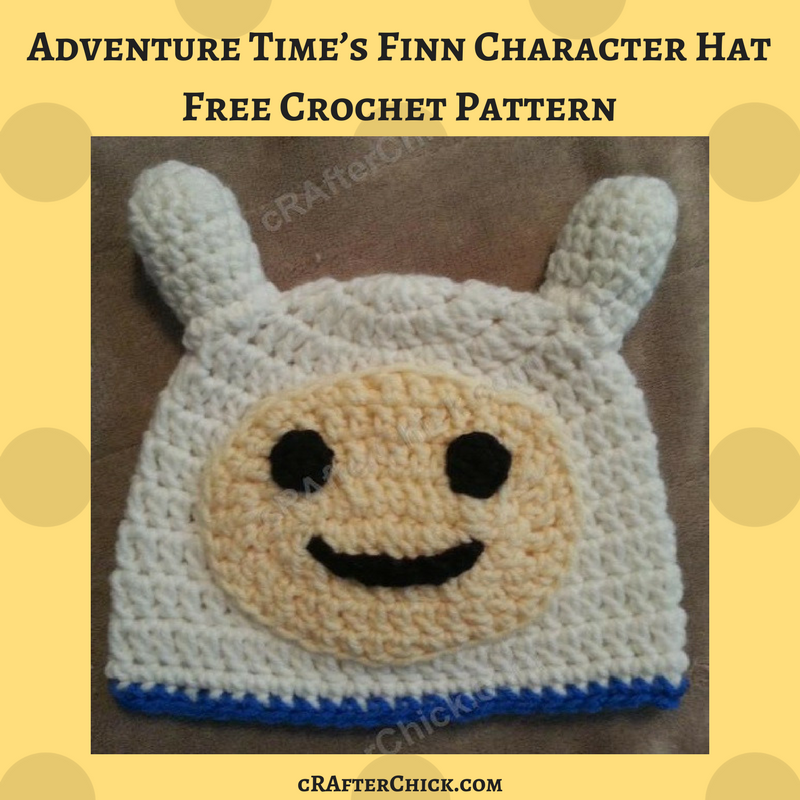 Please let me know if you have any questions about the pattern at all. Happy crafting! 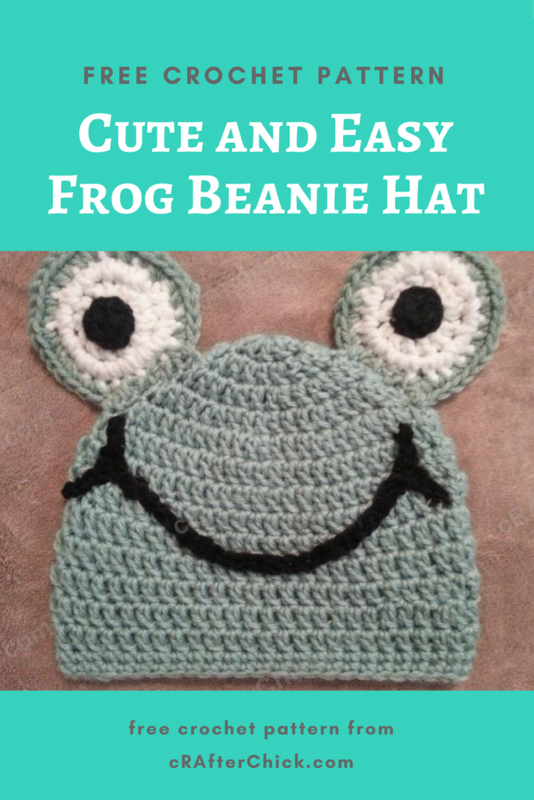 Once you have completed your beanie for the base you are ready to start building your cute frog hat. Leave a long enough yarn tail to be able to sew it on to the eye white in following step before cutting yarn and pulling through loop. 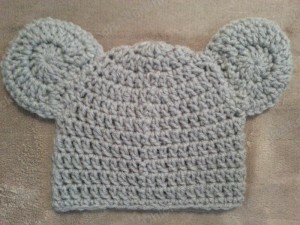 *This feature works well for toddler to adult male sized hats. For newborn to 12 month sized hats, make 3 sc in circle instead of 6 sc pattern calls for above. 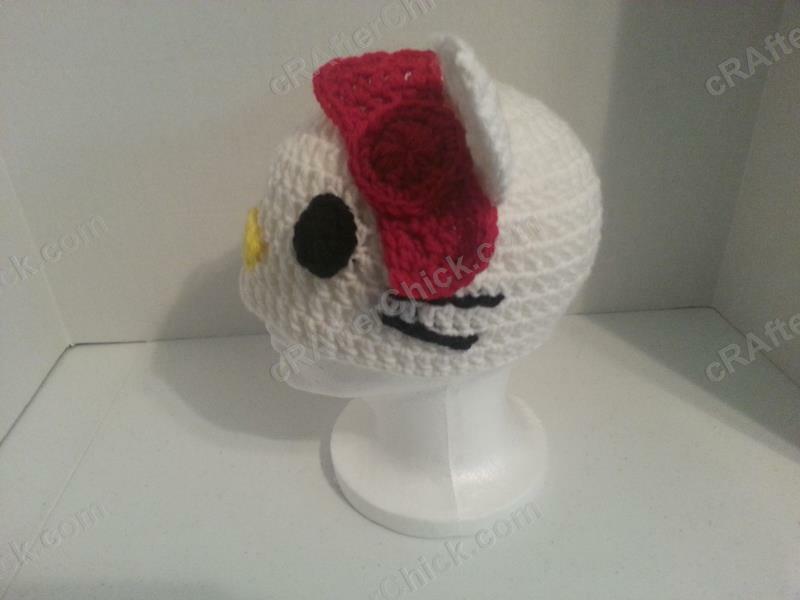 Take the black yarn tail from one eye pupil from previous step and your yarn needle to sew the pupil on to one of the eye white pieces. 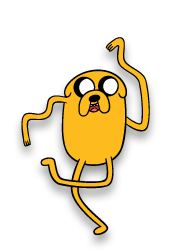 I centered mine on Round 1 of the eye white but you can place it wherever you desire. 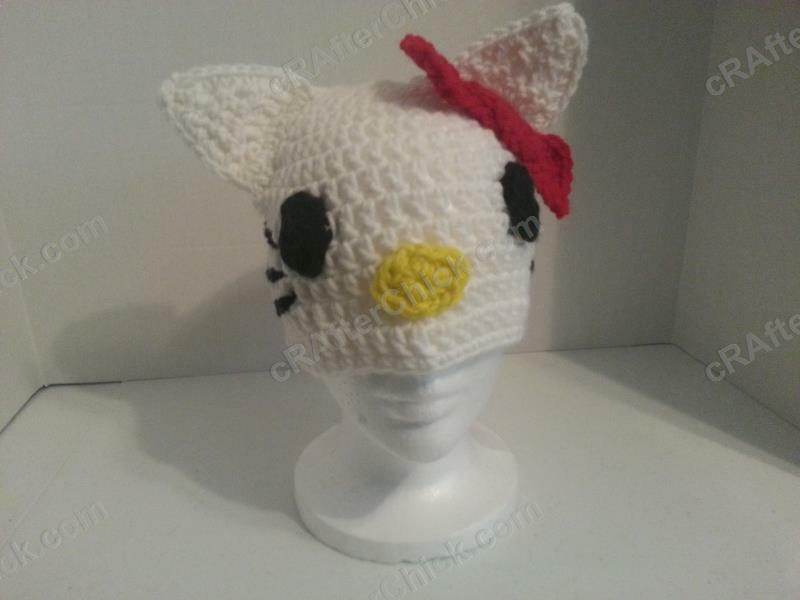 Once secure, pull yarn to back of eye white and fasten off. Eye Backs and Assembly (Make 2): using main color yarn and assembled eye fronts from previous steps. Repeat Rounds 1 and 2 from eye whites above but do not fasten off at the end of round 2. Round 3. Ch 1 and turn. Place one completed eye front in front of the eye back you are working on, lining up the stitches. Working through both pieces at the same time. Place *2 sc in 1st st, 1 sc in next st* repeating * until 4 st are left. Sl st in last 4 st. Sl st in top of 1st st in round. 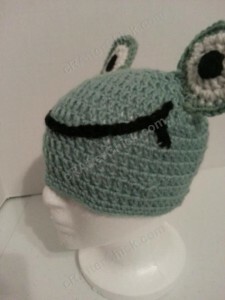 Make sure you leave a nice long yarn tail to sew the frog eye on top of the beanie hat before cutting it and pulling through loop. Round 3. Ch 1 and turn. Place one completed eye front in front of the eye back you are working on, lining up the stitches. Working through both pieces at the same time. Place 2 sc in 1st st and in next 6 st. Place 1 sc in next st, and sl st in last 2 st. Sl st in last 4 st. Sl st in top of 1st st in round. Using black yarn, make a chain of 25. 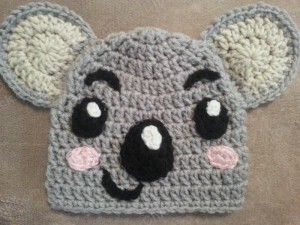 Leave a nice long yarn tail so you can sew this on to the beanie hat during assembly. Cut yarn, pull through last loop and place to side for now. *This feature works well for toddler to adult male sized hats. 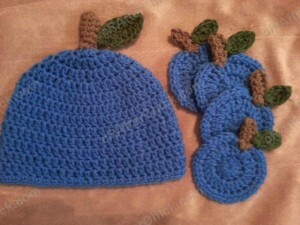 For newborn to 12 month sized hats, make a chain of 16 for newborn or 18 for other infant sizes instead of 25 pattern calls for above. Using black yarn, make a chain of 6. Leave a short yarn tail so you can sew this on to the beanie hat during assembly. Cut yarn, pull through last loop and place to side for now. Repeat process for second smile side. 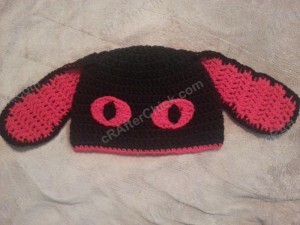 *This feature works well for toddler to adult male sized hats. For newborn to 12 month sized hats, make two chains of 3 ch instead of 6 pattern calls for above. Now you can move on to assembly steps below. 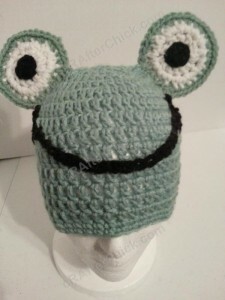 Take the tail from one completed frog eye and your yarn needle to attach to one side of the top of your frog hat. 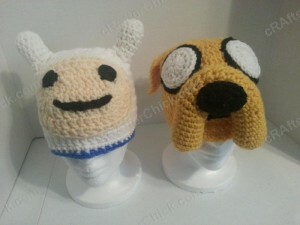 Stitch it on securely. 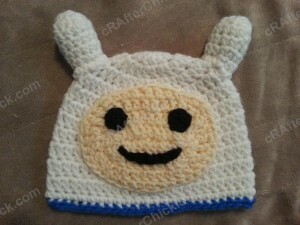 When I place features like this on top of hats I stitch on top of beanie and reinforce with another set of stitches inside but it’s not necessary. Once secure, pull yarn to inside of beanie hat and fasten off. 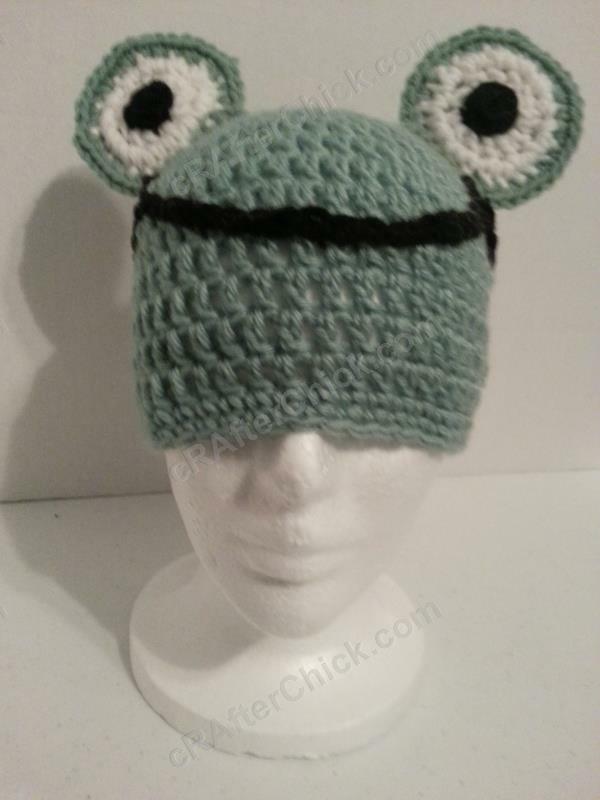 Repeat process for the second frog eye. Using your yarn needle take the black yarn tail from the mouth / smile chain and sew it in desired location on hat front. I sewed mine in a wide “u” shape but feel free to change it up on yours. Once sewn in place, pull yarn to inside of hat and fasten off. Using your yarn needle, take the black yarn tail from the smile side chain and sew it in desired location on one side of the smile you stitched on in previous step. I attached mine in a bit of a curve. 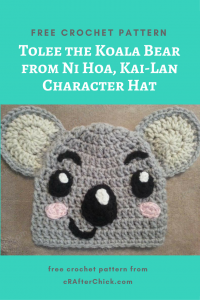 You can reference my pictures to see how I placed them on my hat. 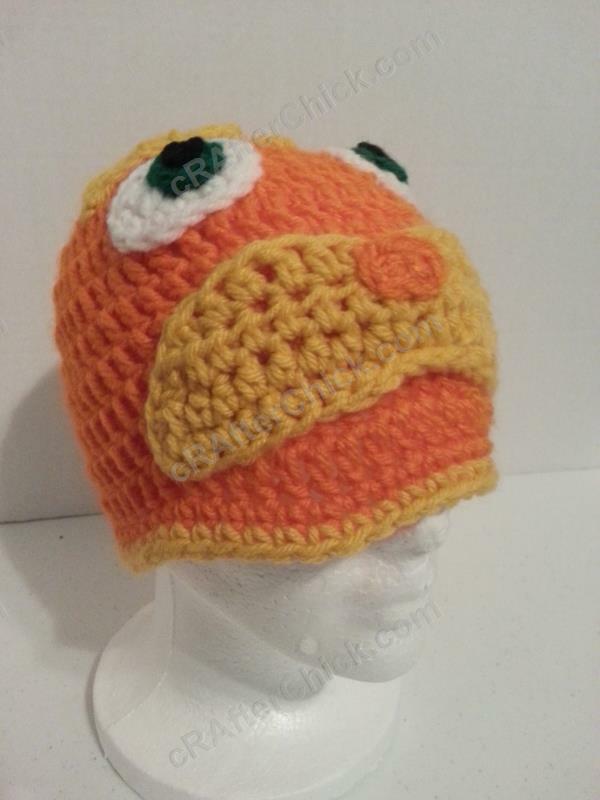 Once sewn in place, pull yarn to inside of hat and fasten off. Repeat this process on the other side of the smile for the second smile side. Now take a few moments to double check over your work for any loose ends or tails you may not of fastened off during assembly of your frog hat. 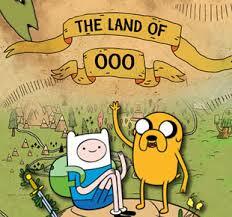 If you find any, go ahead and fasten off. All done! 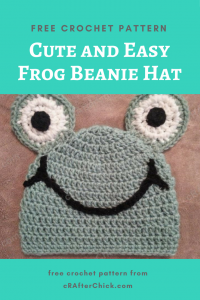 One easy and cute frog hat. 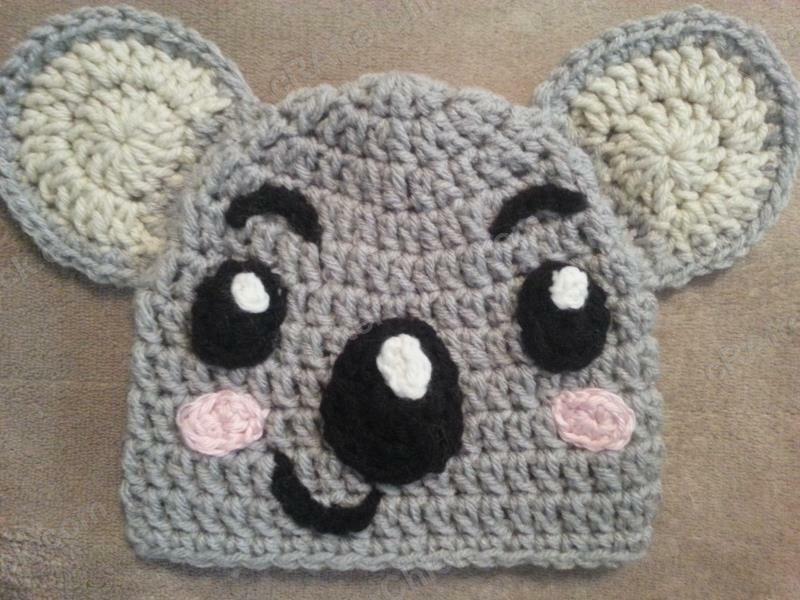 This was a requested hat for my Mom, who is a teacher, to wear during reading this book to her classroom. 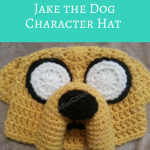 The kids love seeing all the hats for each book or project so it’s fun for me to make these book characters come to life in crochet. This is my crochet interpretation of the Lorax based on the movie character instead of the book character from Dr. Suess. 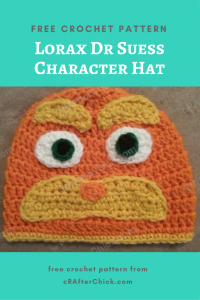 It’s a fun hat to make, wear or give as a gift to the Dr Suess lover in your life. I tried to make it simple and easy for even beginners but if you have any questions, please don’t hesitate to reach out to me. Happy crafting! 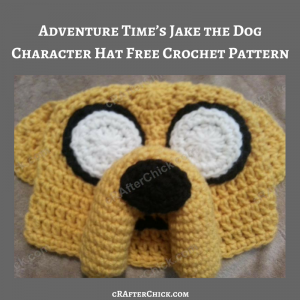 To make the contrast trim, once you have completed your beanie base, attach the golden yellow yarn to the last st worked with a sl st. Ch 1 before placing 1 sc in 1st st and in each of the following st around. Sl st back in top of the 1st st worked before fastening off. 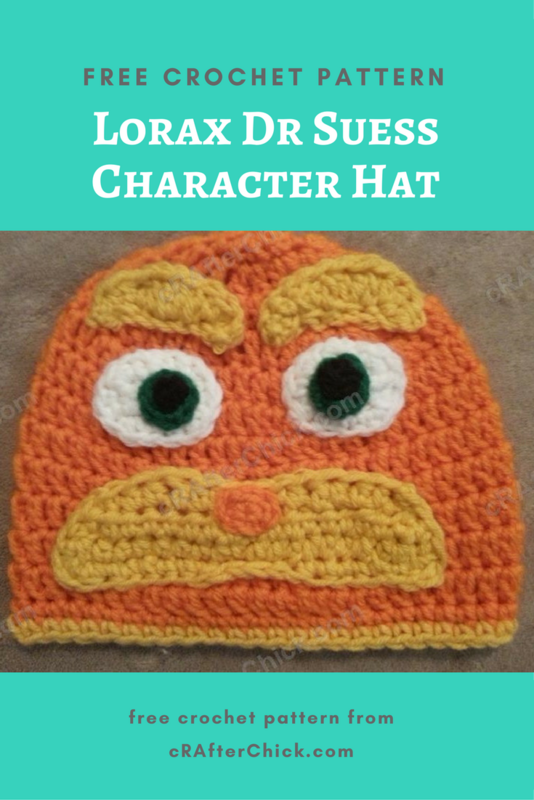 Once you have completed your beanie for the base you are ready to start making the pieces for your Lorax character hat. Leave a nice long yarn tail before cutting yarn and pulling through. You will be using this tail to secure your assembled eyes on to your beanie hat during finishing process. Repeat for second eye white. *The feature above works well on toddler, youth, preteen / teen, womens and men sized hats. For newborn to 12 month sizes, skip Round 2 of above instructions. Round 1: In a magic circle, ch 1 before placing 6 sc in circle. Pull circle closed. Sl st in top of the 1st st in round. Leaving a long enough tail to be able to sew your eye color on to your eye white during assembly, cut yarn and pull through loop. Place to side until needed in finishing steps. Repeat process above for second eye color. 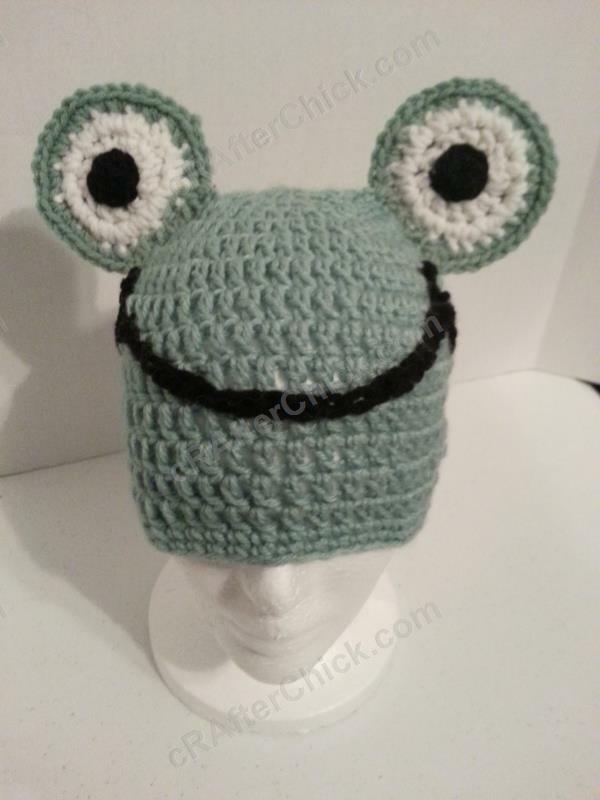 *The feature above works well on toddler, youth, preteen / teen, womens and men sized hats. For newborn to 12 month sizes, make 4 sc instead of 6 sc in instructions above. Ch 3. Sl st in last ch from hook. Cut yarn leaving a short tail long enough to attach to eye color during eye assembly before pulling through. Place to side until needed in future steps. Repeat process for the second eye pupil. 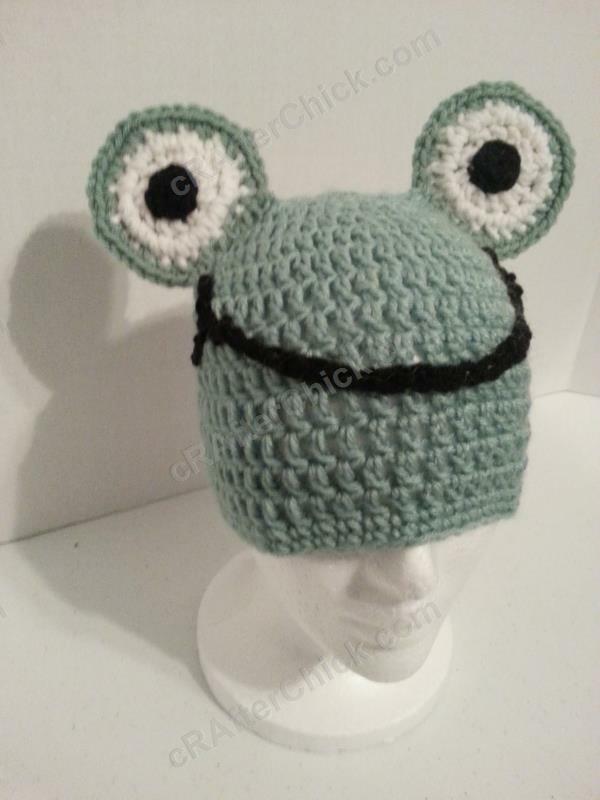 *The feature above works well on toddler, youth, preteen / teen, womens and men sized hats. 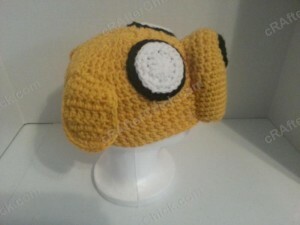 For newborn to 12 month sizes, skip making a chain and just make a large knot to sew in to place. 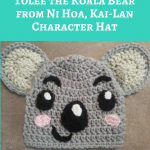 Leave a yarn tail long enough to be able to sew the nose in place on the beanie hat during assembly before cutting yarn, pull through loop and placing to the side until needed. Row 1: Ch 8. Place 1 sc in 2nd ch from hook, 2 hdc in next ch, 1 dc in next ch, 2 dc in next ch, 1 dc in next ch, 2 hdc in next ch and 1 sc in last ch. Sl st in the base of last st worked. Make sure you leave an extra long tail as you will be using it sew your eyebrows in place and freehand stitch on eyebrow edges if wanted like I did in my hat to look more like the Lorax movie character. 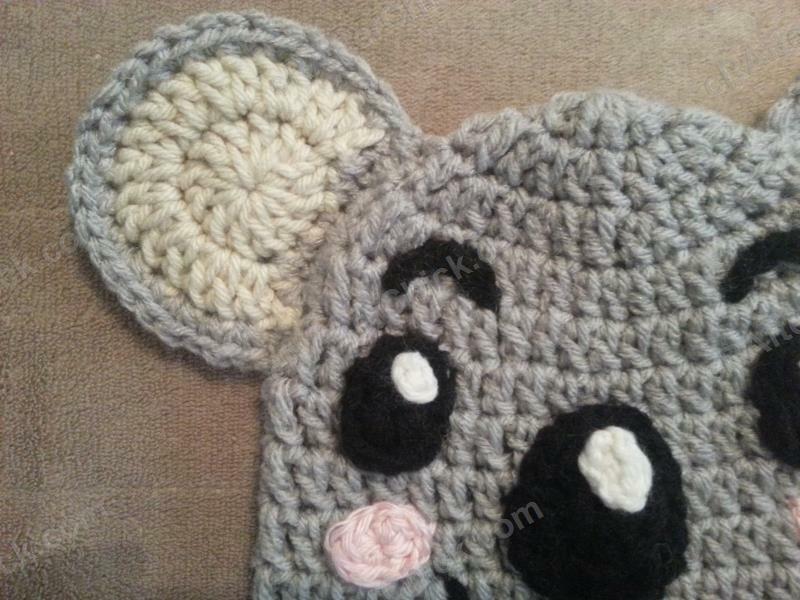 Once you leave a tail, cut yarn, pull through loop and place to side until needed in assembly. 1 sc in next st, 1 hdc in next st, 1 dc in next st, 1 hdc in next st, 1 sc in next st, sl st in each of next 3 st, 1 sc in next st, 1 hdc in next st, 1 dc in next st, 1 hdc in next st, 1 sc in next st and sctog last 2 st. Do not stop row here continue to work 1 sc in each st down the side of this area, placing 3 sc in bottom corner, 1 sc in next st until middle 4 st of bottom reached, sl st in each of the 4 middle st before resuming 1 sc in each st, 3 sc in other bottom corner, 1 sc in each st up to 1st st worked. 1 sc in same sp as 1st st and sl st in top of the 1st st in round. Leave a tail that is long enough to be able to secure this feature on to your beanie hat during assembly before cutting yarn and pull through loop. 1 sc in next st, 1 hdc in next 2 st, 1 sc in next st, sl st in next st, 1 sc in next st, 1 hdc in next 2 st, 1 sc in next st and sctog last 2 st. Do not stop row here continue to work 1 sc in each st down the side of this area, placing 3 sc in bottom corner, 1 sc in next st until middle 2 st of bottom reached, sl st in each of the 2 middle st before resuming 1 sc in each st, 3 sc in other bottom corner, 1 sc in each st up to 1st st worked. 1 sc in same sp as 1st st and sl st in top of the 1st st in round. Now you have all the pieces created. Time to move on to assembly. 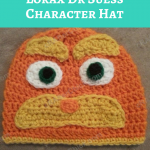 We will start from the bottom up on adding our features to this Lorax character hat. I find it is better to do it this way so that you take the worry out of running out of room and scrunching features together if you run tight on space. You can always move the next feature up but there is no moving down. 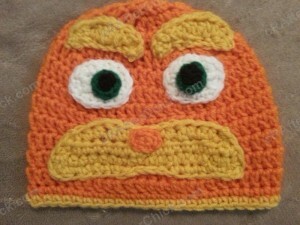 sew the mustache securing in place a little above the bottom of the hat. You can reference my pictures to see where I placed my own. Once that is completed, pull your yarn to the inside of the hat and finish off. 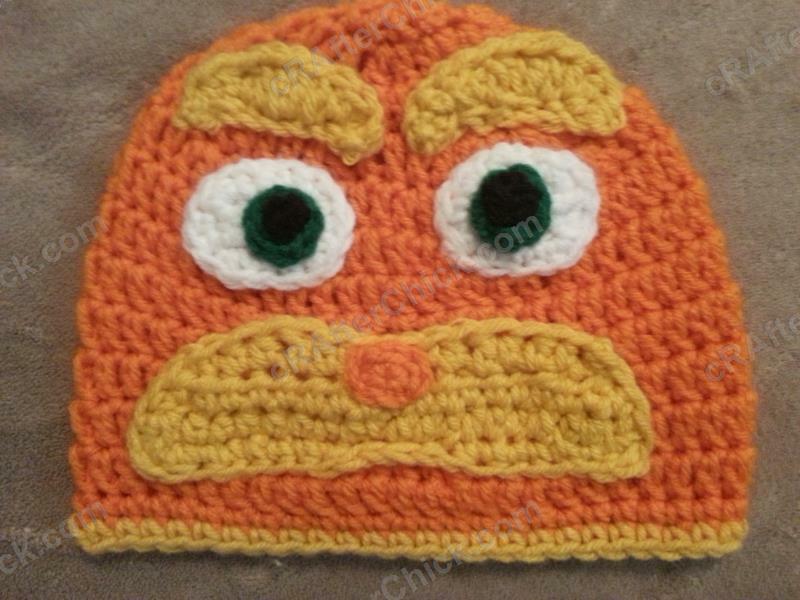 Taking the tail left on his nose piece and using your yarn needle sew the nose in place on the top center of his attached mustache / whiskers area that you sewed on in previous step. 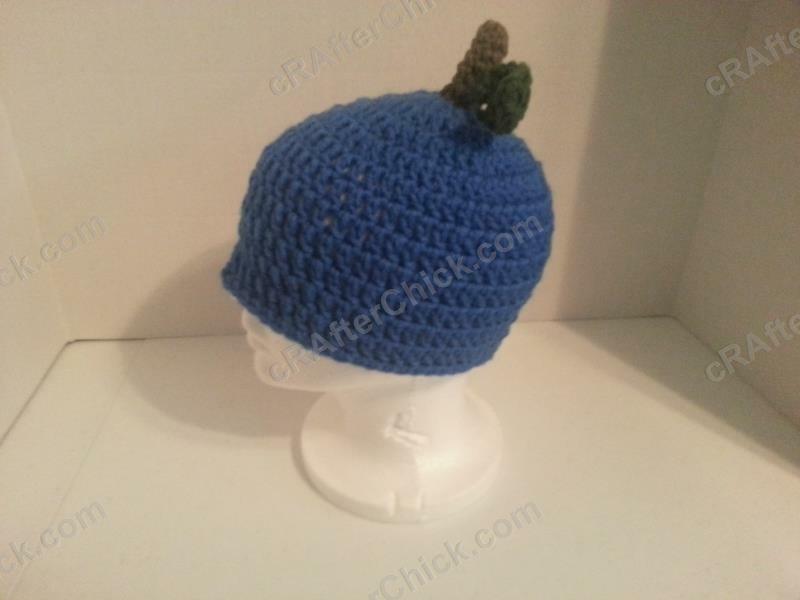 Once sewn in place completely, pull yarn to inside of beanie hat and fasten off. You now want to take the yarn tail left on one eye pupil and sew it in place with your yarn needle onto one green eye color. 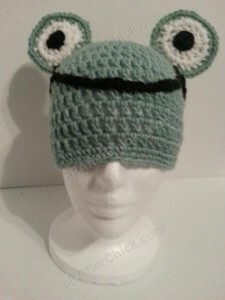 After attached, pull yarn to back of eye color and fasten it off. Repeat this process for the second pupil. Take the green yarn tail from one of his eye color pieces and secure it in desired place on one eye white sewing it together with your yarn needle. Once done, pull yarn to the back of the eye white and fasten off. Repeat this process for the second eye color. Taking the white yarn tail from one assembled eye use your yarn needle to sew the eye in place off to one side of nose above the whisker area. 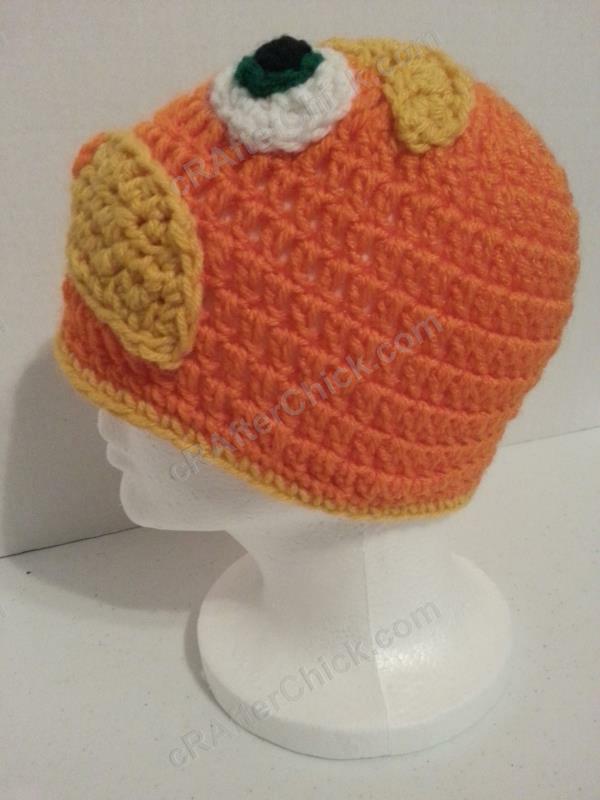 Once secured in place, pull yarn to inside of hat and fasten off. Repeat process for second eye, equal distance on the opposite side of the nose. 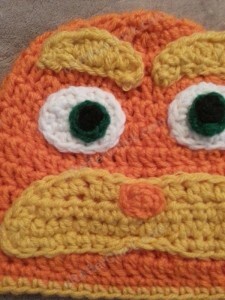 Taking the tail from one your Lorax’s eyebrows and your yarn needle to sew the eyebrow securing in place a little above one attached eye. You can reference my pictures to see where I placed my own. Once that is completed, pull your yarn to the inside of the hat and finish off. Repeat this process for the second eyebrow placing it over the second eye. Now take the time to check over your work for any yarn tails or loose ends you may have missed during assembly. If you find any, go ahead and fasten them off. All done. 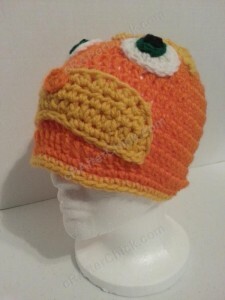 One cool Lorax hat ready to wear. If you haven’t guessed by now I’m a self proclaimed geek and totally nerd out over anything geeky, math, science… Big Bang Theory. 😉 So when I saw this hoodie online I thought I would see how it translated in to a crocheted hat. I had to make the applique a bit bigger than I wanted to fit all the details that needed to be sewn on and it was a big pain for someone like me that hates to sew pieces together. 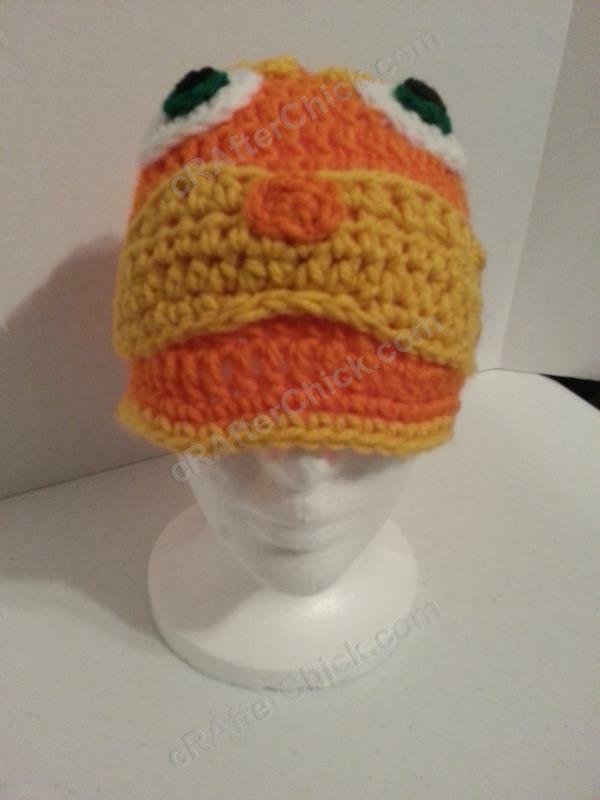 However that being said, you just need basic beginner crocheting skills to make this hat design so give it a try. I do recommend using safety pins or straight pins during making the logo so it takes a lot of the guesswork out while you are stitching. Now I just have to find something in my mostly black wardrobe to wear this hat with. Happy crafting! 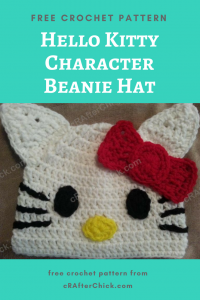 Once your beanie base is completed, take your white yarn and attach it to last st worked with a sl st. Ch 1 before placing 1 sc in 1st st and in each of the st around. Sl st in top of the 1st st in round. Fasten off. 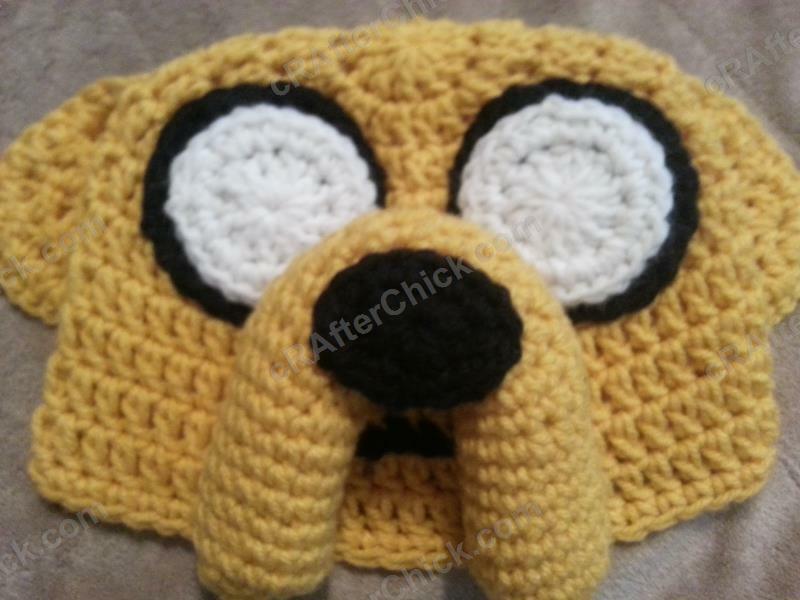 Now you are ready to start making the front logo for this hat. The feature above works well on toddler through adult sized hats. For sizes 6 to 12 months, leave off Round 4. 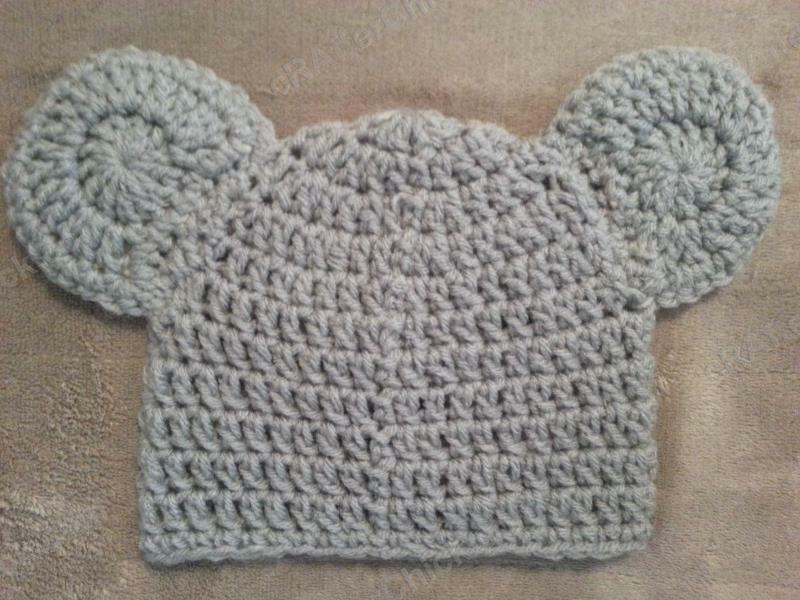 For sizes newborn to 6 months, leave off Round 3 and 4. Make a chain of 30. Sl st in last ch from hook. 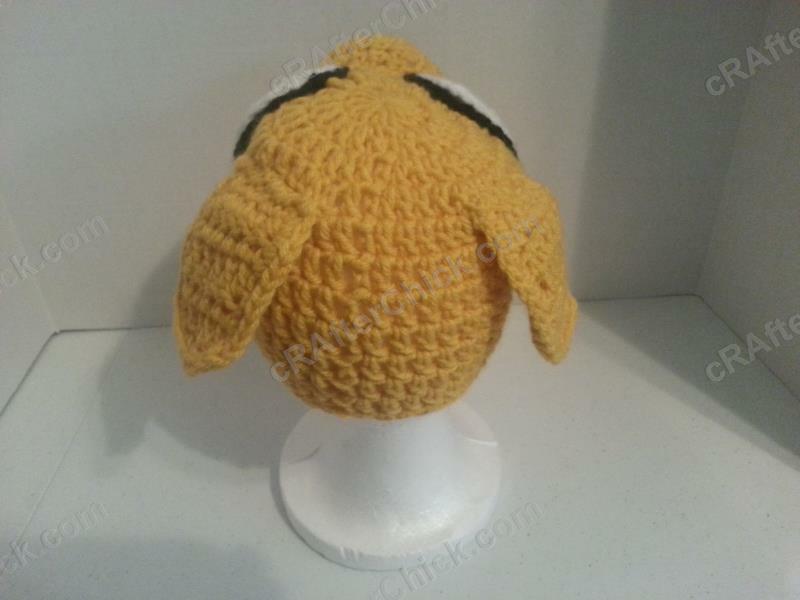 Make sure you leave an extra long tail to sew in to place during logo assembly. 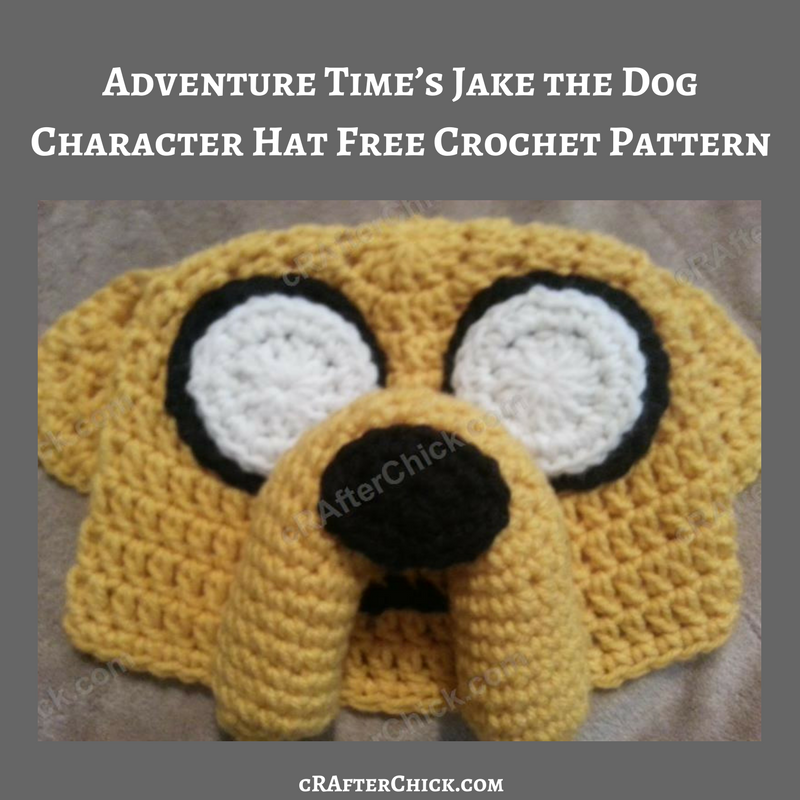 I normally judge between 3 to 4 times the length I will be stitching in place when doing this kind of piecework in my crochet. 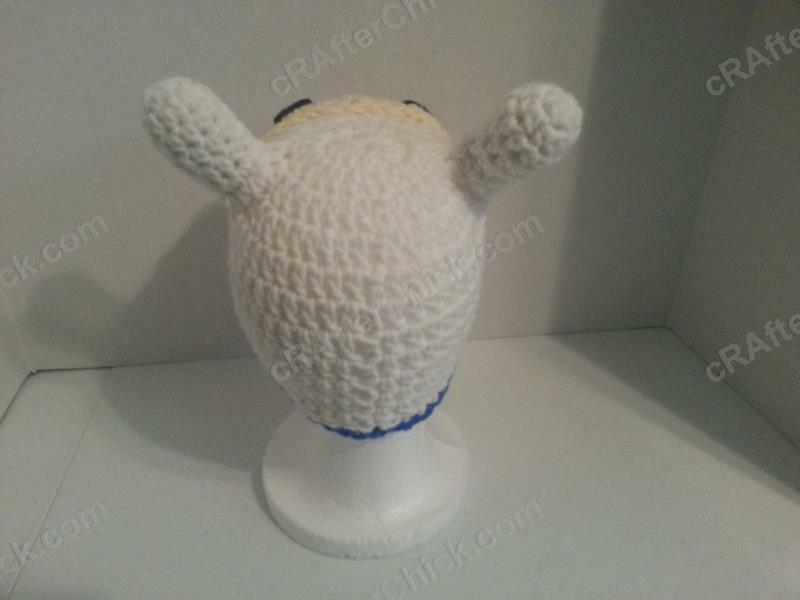 Cut yarn, leaving tail, on hook and place to side until needed in assembly. Repeat process for other two. 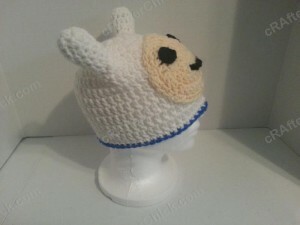 This feature above works well for toddler to adult sized hats. For sizes 6 to 12 months, make a chain of 25 instead. For sizes newborn to 6 months, make a ch of 20. Leaving a long enough of a yarn tail to be able to sew these in place for your logo during assembly, cut yarn, pull through loop and place to side until needed. Repeat process for next 3 pieces. This feature works well for toddler to adult sized hats. 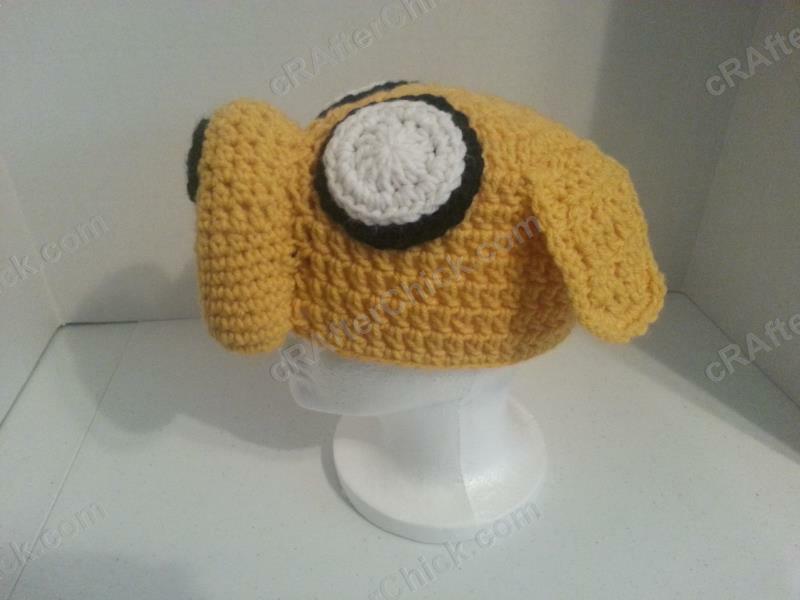 For newborn to 12 month sizes, ch 3 and sl st in last chain for these pieces instead of above instructions. 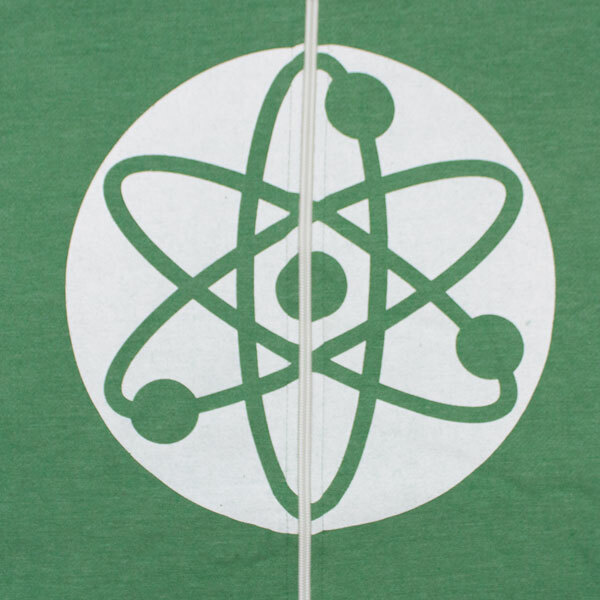 Taking the chain loop from one of the atom orbit lines you made earlier and use your yarn needle stitch it in to place to start making your atom logo shape. See pictures above to see logo layout and how I placed my own. Once secure in place, pull yarn to back of logo circle and fasten off. Repeat this process for the other two atom orbit lines. Tip: I use straight pins or safety pins to attach where I want my lines to go before I start stitching. Then I don’t have to keep stopping to check my lines etc. Now take one of the nucleus and electron circles you created in earlier step. 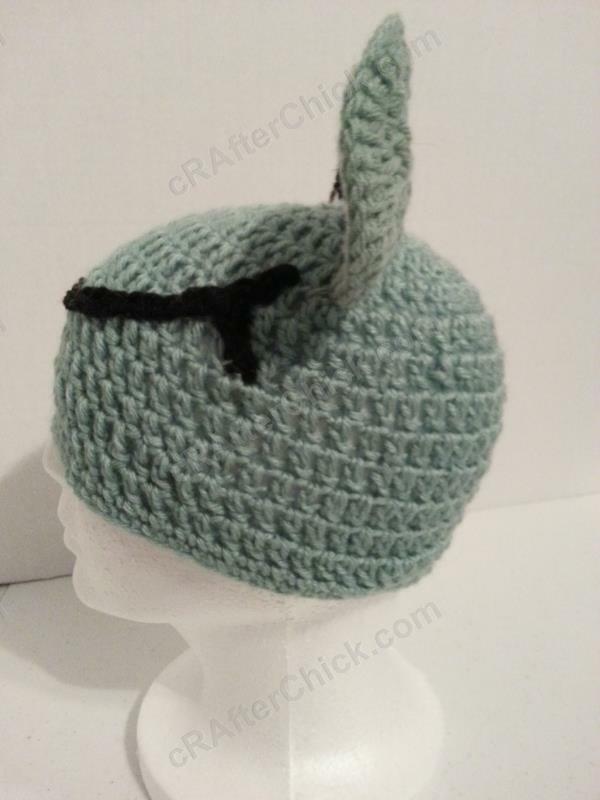 Use the leftover yarn tail and yarn needle to sew this one in place in dead center of your atom orbit lines. Once secure, pull yarn to back of logo circle and fasten off. Taking the tail from one of the electrons, place on orbit line trail as seen in pictures. 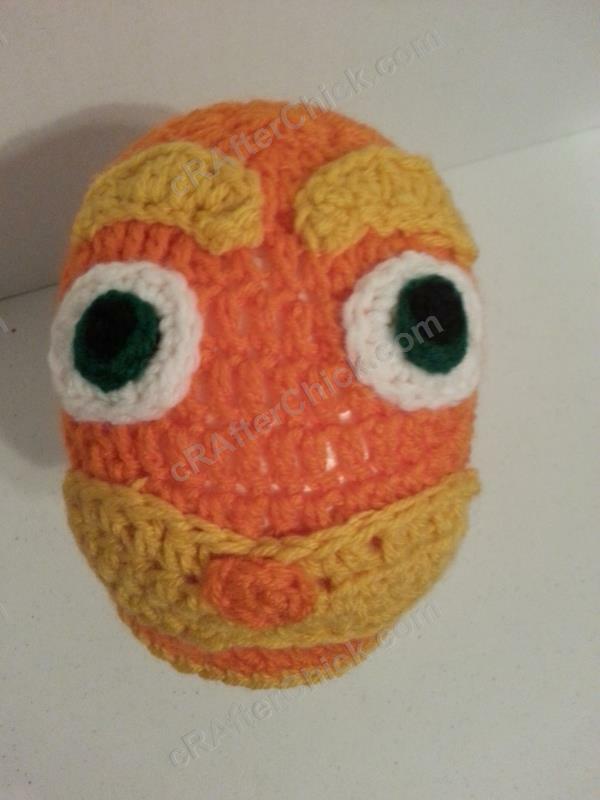 Use your yarn needle to sew it in place. Once attached, pull yarn to back of logo circle before fastening off. Repeat process for remaining two electrons. At this point you should only have 1 yarn tail left, an extra long white tail from your assembled logo circle. If you have any others, fasten them off now. 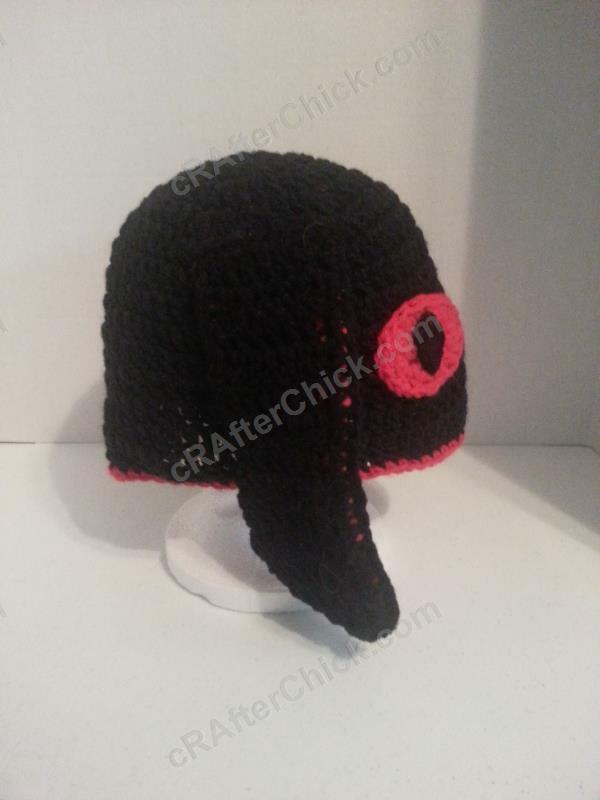 Next take this remaining tail and use your yarn needle to sew your logo circle securely in place on the front of your beanie hat in desired location. I just use a basic in and out stitch as my sewing skills are sadly lacking. 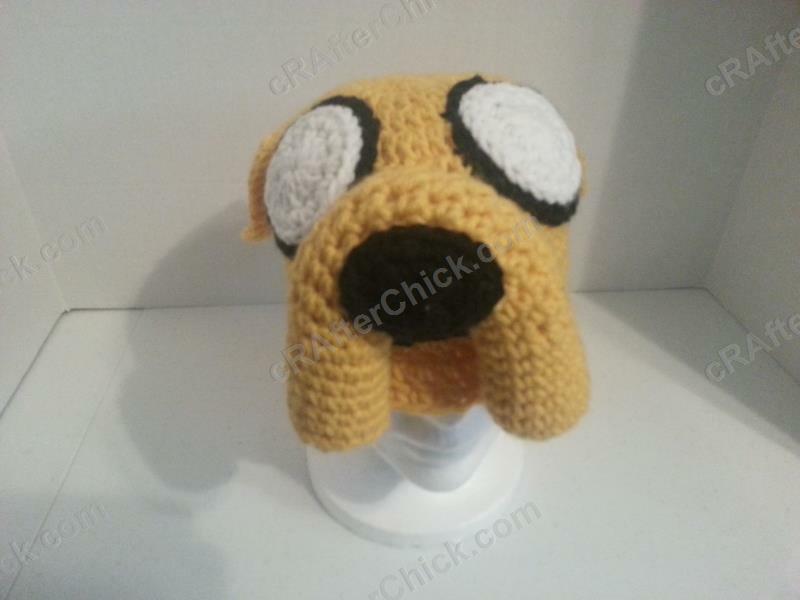 😉 Once you have sewn it on fully and secured it in place, pull your tail in to the inside of your beanie hat and fasten off. Now double check over your hat for any loose yarn tails or ends you may have missed in process. If you find any, take the time now to sew them in and fasten off. All done. I hope you enjoy my patterns and find everything easy enough to understand. I’m still new at this so feel free to drop me a line or comment if you have any questions or see crazy typo. Happy crafting! Although this happy icecream applique came out a bit bigger than I originally planned for it to be I still like it. It’s going to make a fun add for a baby bib with my Easy Baby Bib pattern and baby granny square blanket I’m making with food appliques. 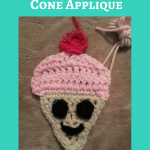 I made this crocheted icecream applique on a whim one day when bored. 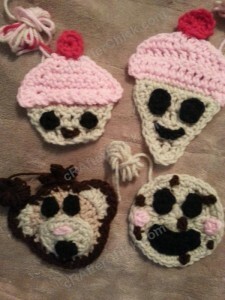 I actually made a little set which you can below that so far includes Happy Cupcake Applique Crochet Pattern, Happy Chocolate Chip Cookie Applique Crochet Pattern and Silly Monkey Face pattern that I still have to type up. 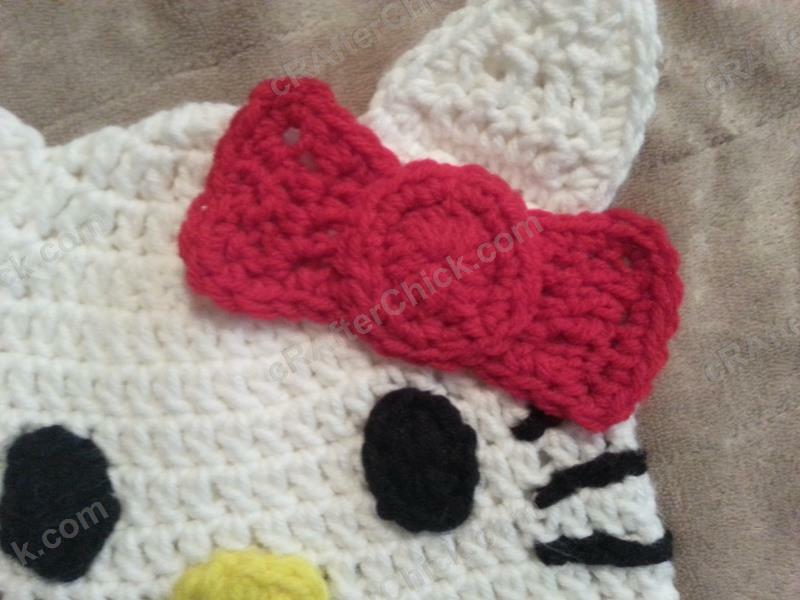 I’m hoping once I catch up on all of my projects in progress I can make a few more to get the blanket complete. 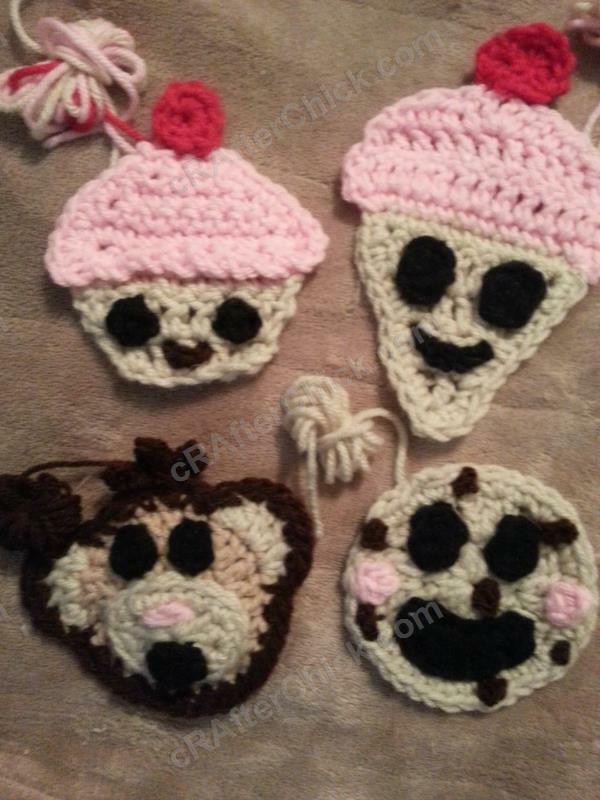 Here is a picture below of the little set all together plus a silly monkey one I made up at the same time. Row 5: Make 2 sc in 1st st, 1 sc across to other top corner of cone placing 3 sc in corner, 1 sc down the side of the corner, 3 sc in bottom of cone st, 1 sc in each st up the last side of cone triangle, placing 1 sc in same st as 1st worked. Sl st in to the top of the 1st st in round. Make sure you leave a long enough yarn tail to be able to sew your icecream cone base part of the applique on to your desired project before cutting yarn and pulling through before you cut the yarn and pull through loop. Leaving a long enough yarn tail to be able to sew your icecream scoop part of the applique on to your desired project before cutting yarn and pulling through. 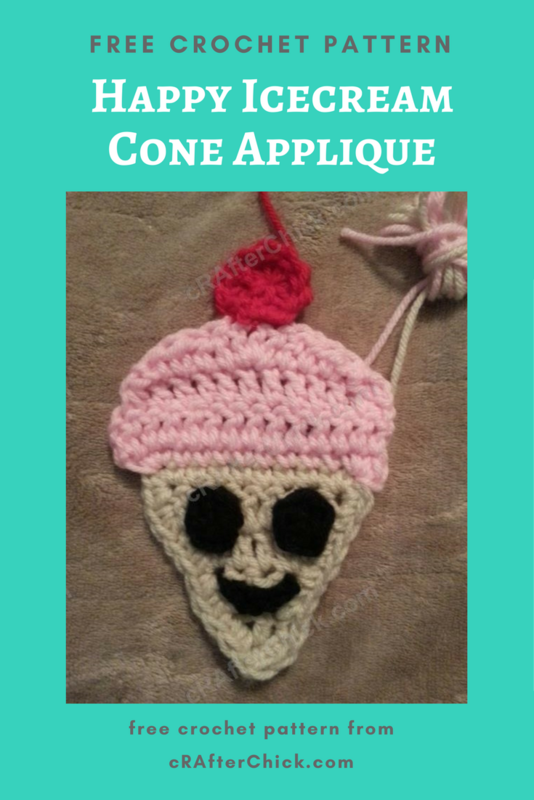 Leaving a long enough of a yarn tail to be able to sew your cherry part of the icecream cone applique on to the top of your applique and on to your desired project before cutting yarn and pulling through. 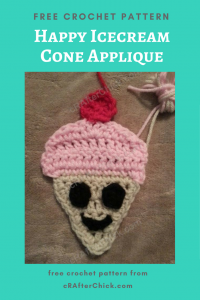 Leave a long enough yarn tail to be able to sew your eye on icecream cone applique during assembly before you cut yarn, pull it through and place to side until needed in steps below. 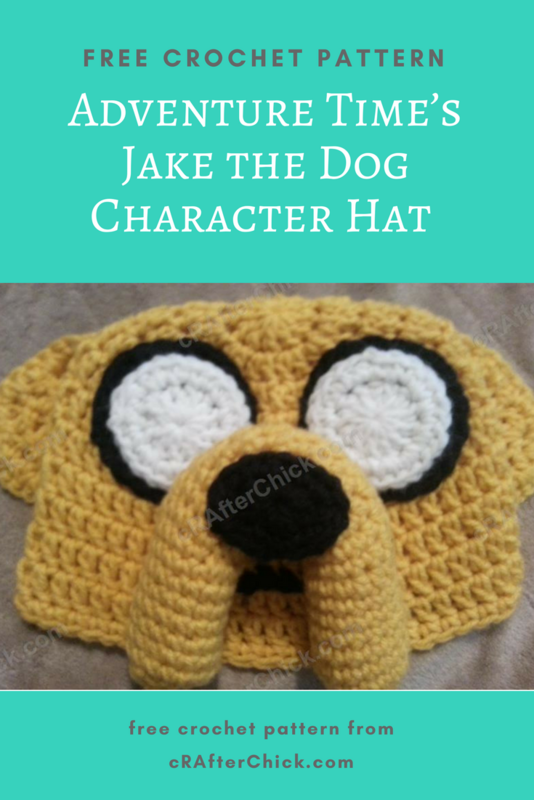 Set aside a small amount of black yarn like you used for the eyes so you can freehand stitch on a smile during finishing steps. Taking the tail from your icrecream cone’s cherry and a yarn needle sew your cherry on top of the icecream topper (pink) part of your applique. 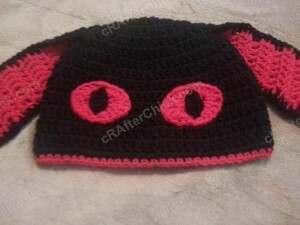 Pull extra tail through to back of applique and leave until attaching to your project. 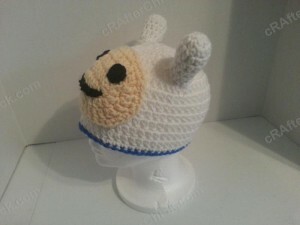 Taking the tail from one of the assembled eyes and your yarn needle, sew your icecream cone’s eye in desired location. You can reference pictures to see how I placed my own. 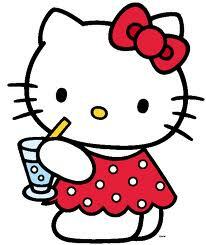 It’s up to your personal preference though. Once fully secure, pull yarn to back side of applique before fastening off. Repeat process for the second eye. 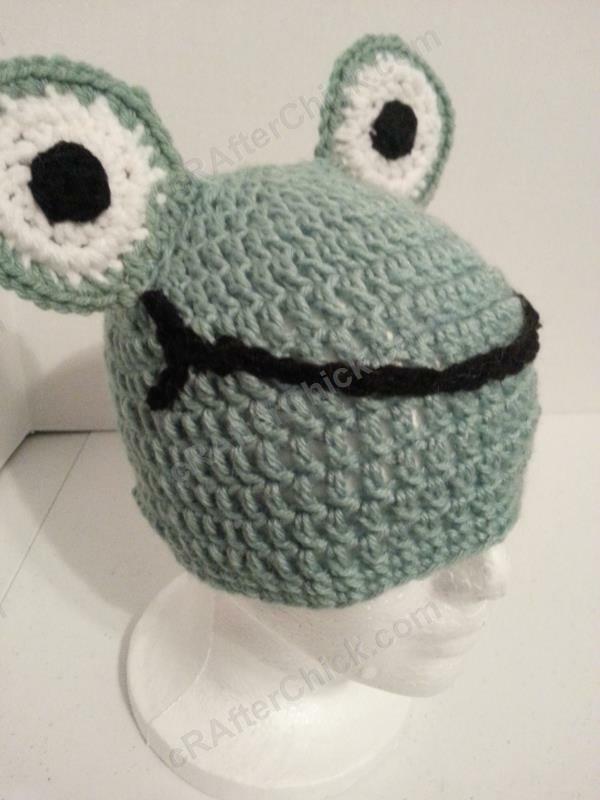 Taking your short length of black yarn to placed to the side for the mouth and the yarn needle, freehand stitch the mouth or smile in desired place on your applique. Again you can see my pictures on where I placed my own or play around with your own placement. Once stitched in place, pull yarn to back side of applique and fasten off. 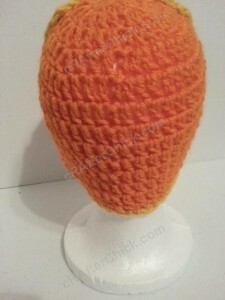 3: Tan or light brown yarn tail for icecream cone. Why three tails? You will be using each tail to sew on the coordinating color of your applique on to your desired project. 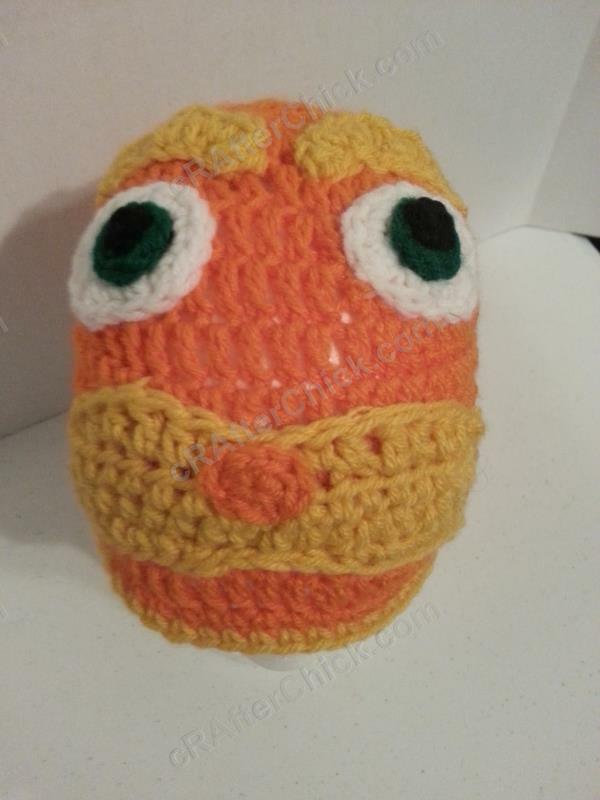 If we used just one tail you would have contrasting colors in stitches running around perimeter to secure your icecream cone applique in place. 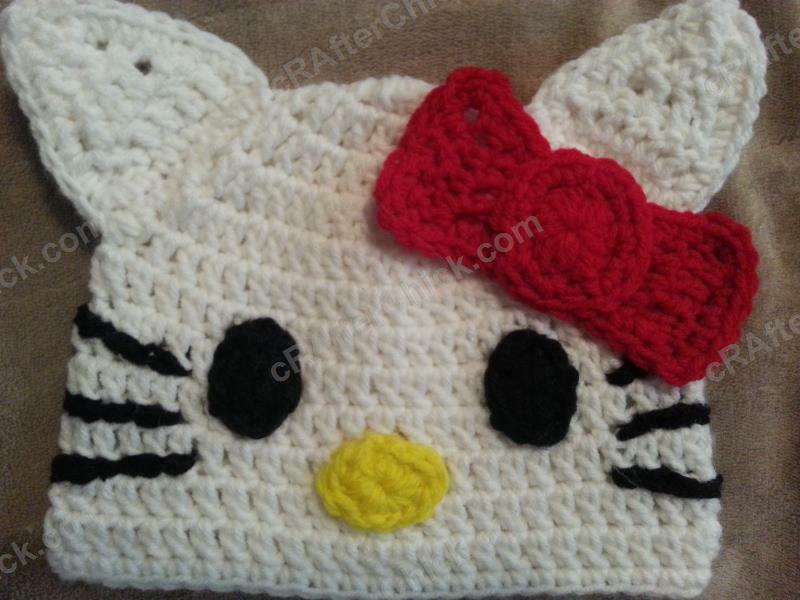 Now check over your crochet project for any other tails or ends (besides those just mentioned above) that you may have missed in process to weave in and finish off. 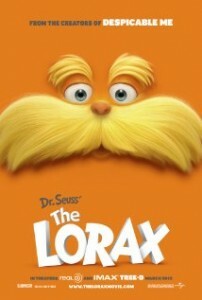 Do so if you find any. All done! You just need to figure out what project you want to attach your chibi happy icecream cone applique to now. Once you have decided and are ready to attach your applique to project. Proceed to following steps. Taking the tail left from your cherry and your yarn needle, sew your cherry part of your applique on to your desired project placement. Once secure pull yarn through to inside or back of project before fastening off. Next take the tail from your icecream topper (mine in pictures is pink) and yarn needle to sew the icecream scoop part of your applique securely in place. Once done, pull yarn to back or inside of project and fasten off. 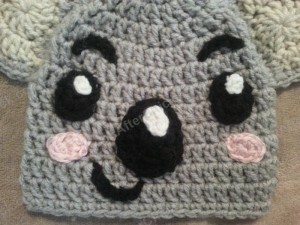 Now you just need to use your yarn needle and tail leftover for the icecream cone base to secure that part of the applique in place on to your project. Once your applique is fully secured, pull yarn to back and fasten off. That’s it. 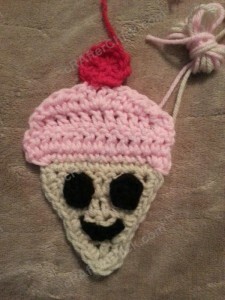 Now I just need to figure out what project I want to attach my happy icecream cone applique to! A blue apple? 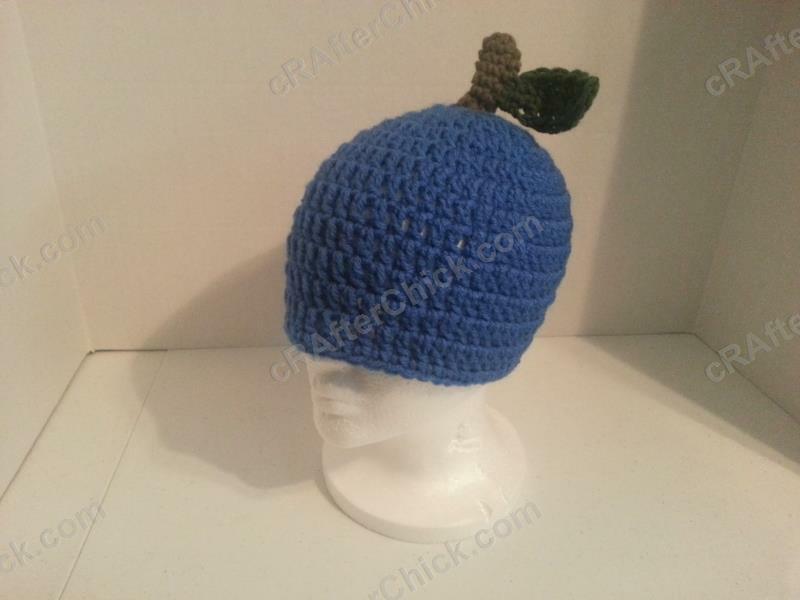 I’m sure more than a few of you are wondering why I made a blue apple hat. This hat was designed for a certain person in mind. She is a health activist for Autoimmune Arthritis living with Ankylosing Spondylitis and runs the Feeding Edge where she posts her an apple a day awareness art. The blue apple signifies arthritis awareness. 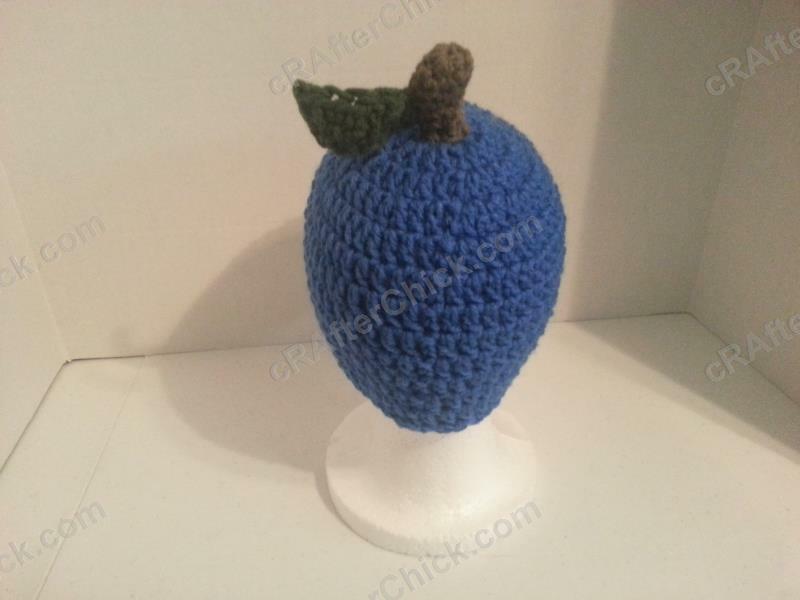 So I had to make an arthritis awareness blue apple just for her. Of course you can switch it up to any color you want for your apple hat. 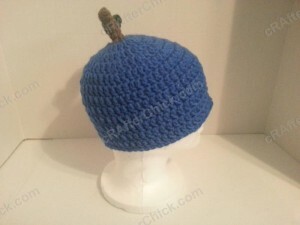 The pattern would be the same just change the main color for the beanie base. If you are wondering with Anklylosing Spondylitis is, you can learn more about this form of Autoimmune Arthritis here. If you would like to learn more about Jenna’s efforts, check out on Facebook or her website here. I actually liked how well the blue apple hat turned out that I decided to make up a matching set of coasters to send with her gift. I will be adding that pattern to the blog as well in case you like them too. Happy crafting! 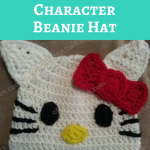 The hat in these pictures are made with my free Easy Peasy Pre-Teen / Teen / Women Double Crochet Beanie Pattern which you can find here as a foundation for the project. Want it in another size? No worries. 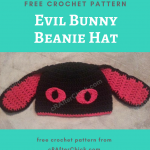 Head over to Easy Peasy All Family Sizes Free Double Crochet Beanie Patterns to select the size of the free pattern you want for your project. 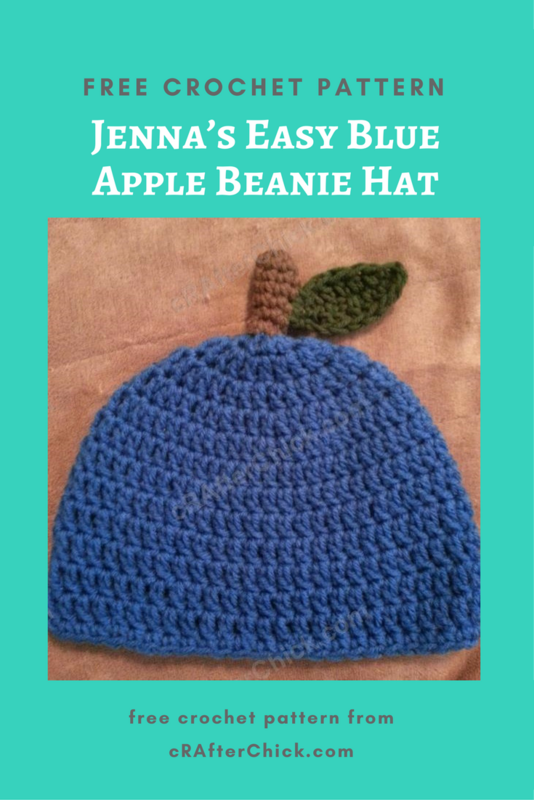 Use Easy Peasy Crochet Beanie Size of your choice Once you have completed your beanie for the base you are ready to start on making your beanie hat into an apple hat. Note: The sl st in each of the 4-6 rounds above help give the stem a curve so you can have it bend slightly to the side like a real apple’s stem and to balance out the weight of the leaf once you attach it on the opposite side. 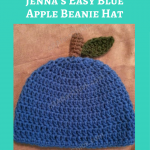 Leave a long enough of a yarn tail to be able to secure your stem on to your apple beanie hat during finishing steps before cutting yarn and pulling it through last stitch. Put stem to side until needed during assembly. Leave a short tail long enough to be able to sew your leaf securely on to your apple hat’s stem, before cutting yarn and pulling it through st. Move on to finishing off steps below. Using the tail from your stem’s leaf and the yarn needle use the tail to sew your leaf on to the apple’s steam in your desired location. 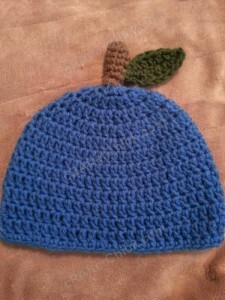 You can reference my pictures to see how I placed it on my blue apple hat. I placed mine on the opposite side of the curve made in the bottom of the stem’s rounds. 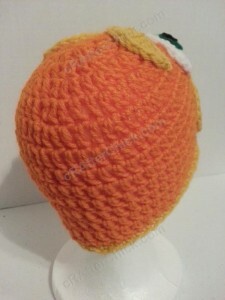 Once your leaf is anchored in place on the stem, pull yarn to inside of stem and fasten off. Using tail from your stem and your yarn needle sew the stem in place centered over the middle of the 1st round in your beanie base. I secured mine so that the curve of the stem is on left side and the leaf on the right side of the stem, when it is facing you. If you want to add a pinch of fiberfill stuffing to your stem to keep shaping like in my pictures, do so now before you finish stitching it on. Once securely in place and sewn all around, pull yarn to inside of the beanie hat before you fasten off. Double check over your work for any loose ends or tails you might of missed during steps above. If you find any, take this time to fasten them off. All done! 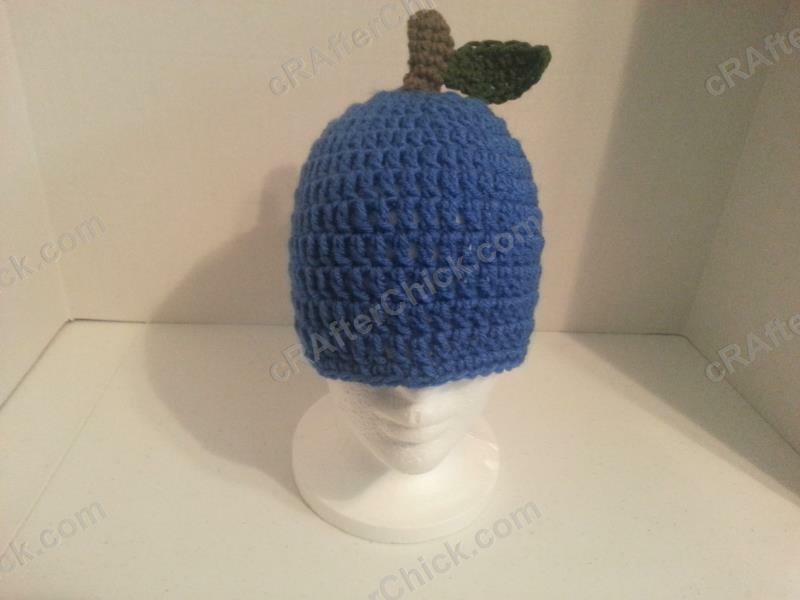 One easy and fun apple beanie hat ready to wear.